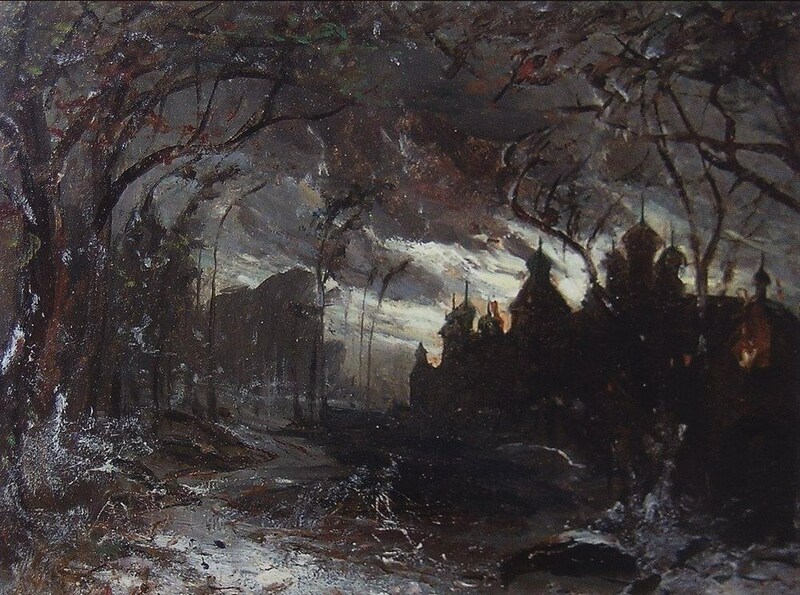 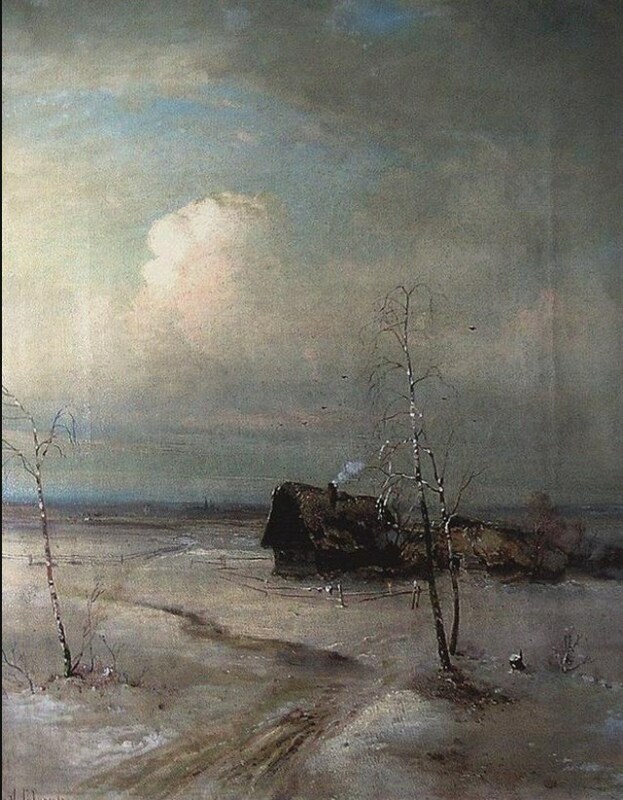 Alexei Savrasov was the son of a Moscow merchant. 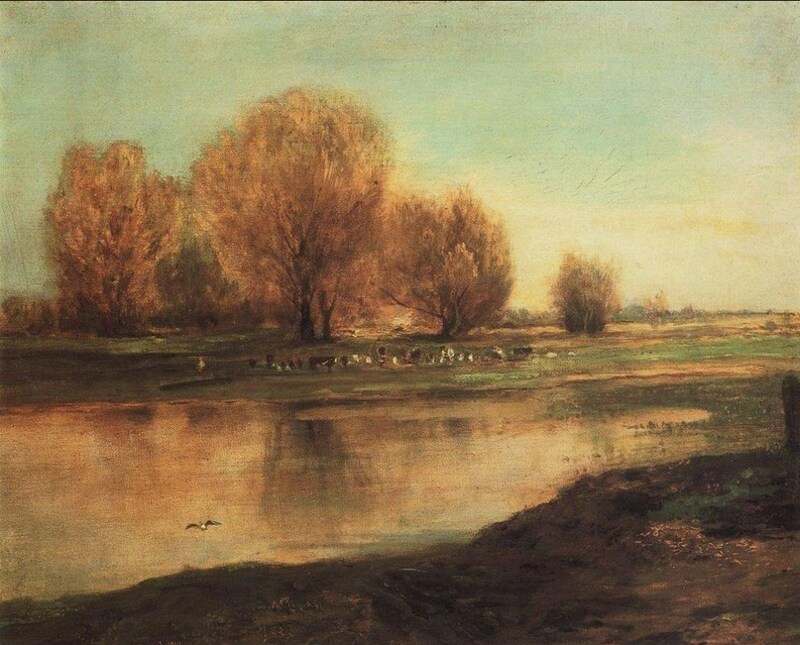 In his early youth he demonstrated an un­common talent for painting. 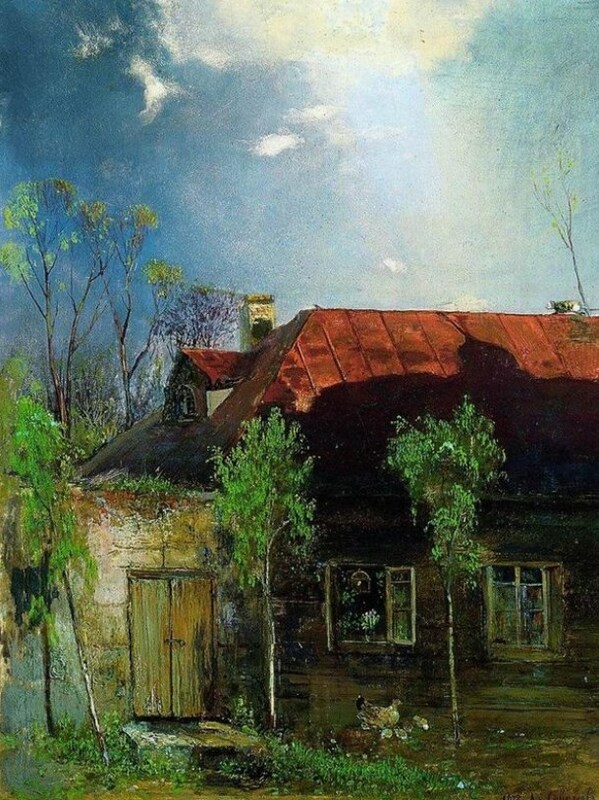 Despite the wishes of his father, who hoped to attract his son into the world of commerce, Savrasov entered the Moscow School of Painting and Sculpture. 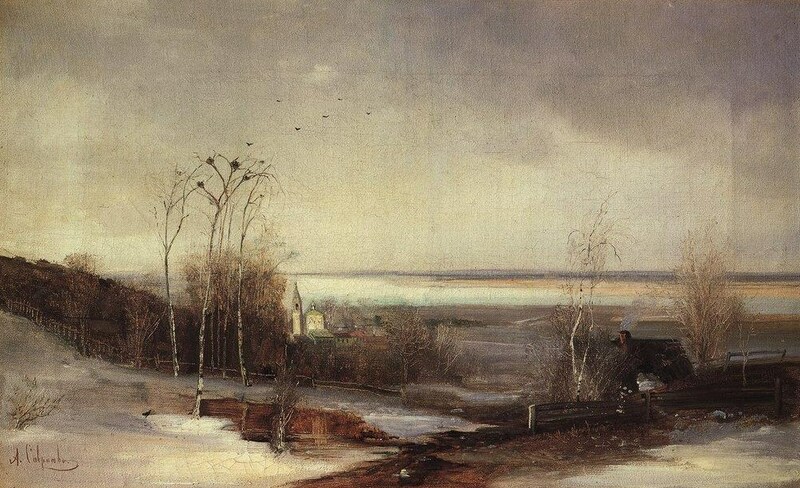 That was in 1844, and four years later the report of the Council of the Moscow Art Society men­tioned his name as the best pupil in the perspective and landscape class taken by the artist K. I. Rabus. 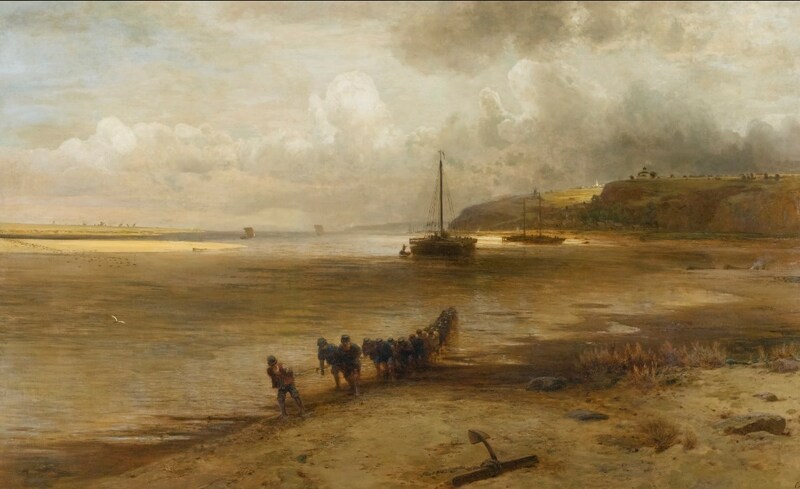 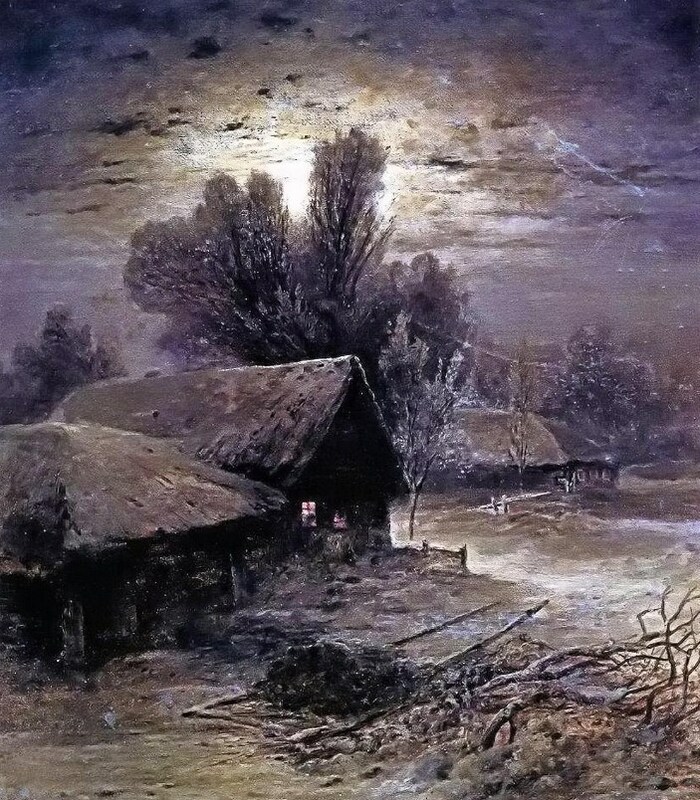 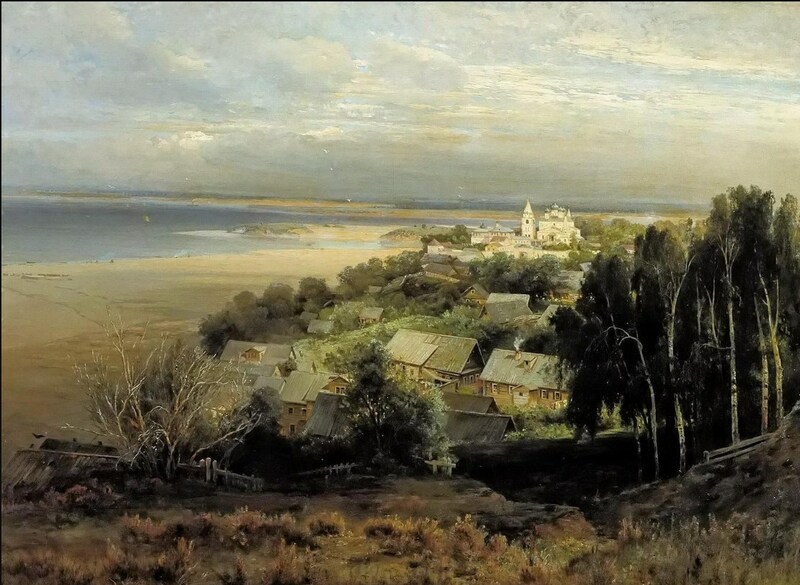 Supported financially by I. V. Likhachov, an art patron and member of the Council of the Moscow Art Society, Savrasov was one of a number of students who travelled in the summer of 1849 to the south of Russia, where he painted views of Odessa and the Ukraine. 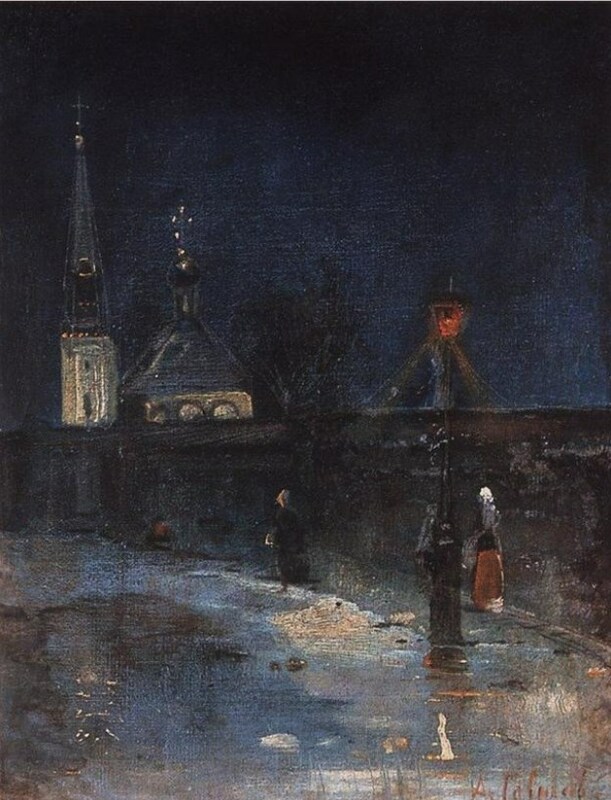 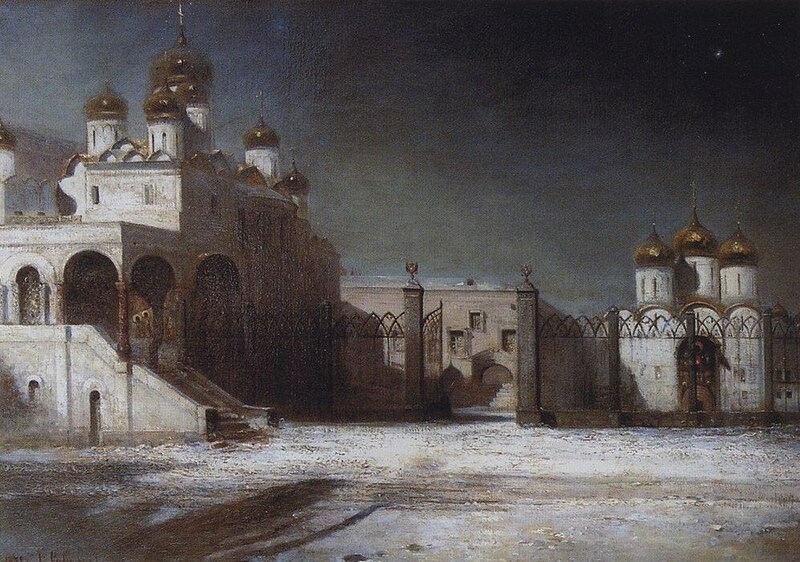 For his class works of that year he was awarded a merit certi­ficate, and on 25 September 1850 he received a civil rank for View of the Moscow Kremlin by Moonlight and Stone at a Small Stream, but he remained registered as a pupil. 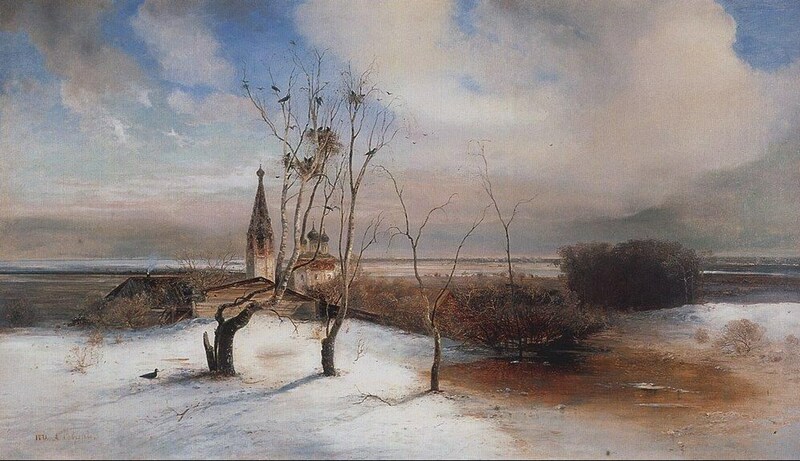 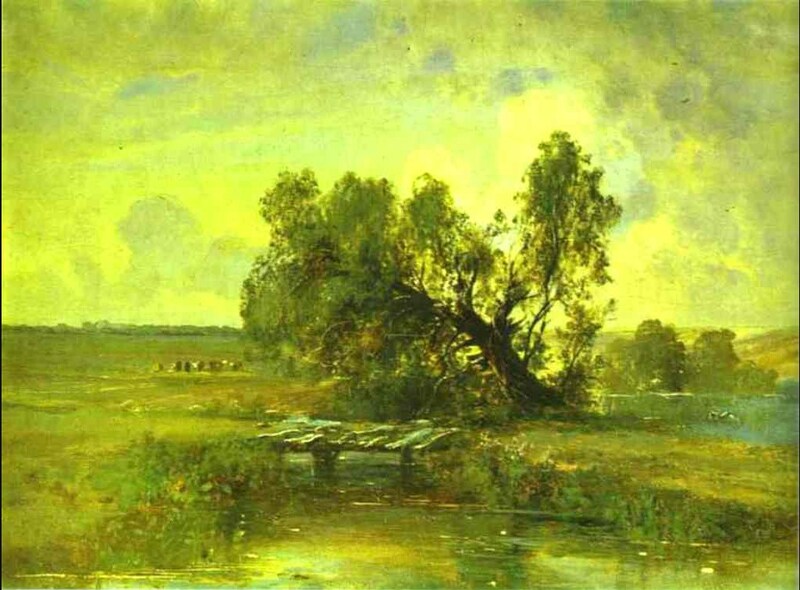 Savrasov’s first landscapes followed directly in the traditions of the academic school. 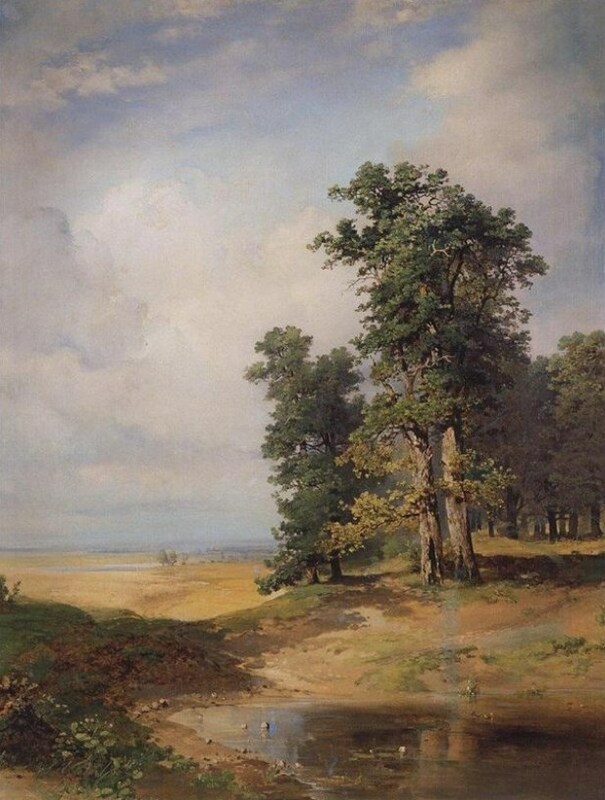 Acade­mic landscape-painting in the forties and fifties was predominantly romantic in direction, and Savrasov’s teacher also favoured this style. 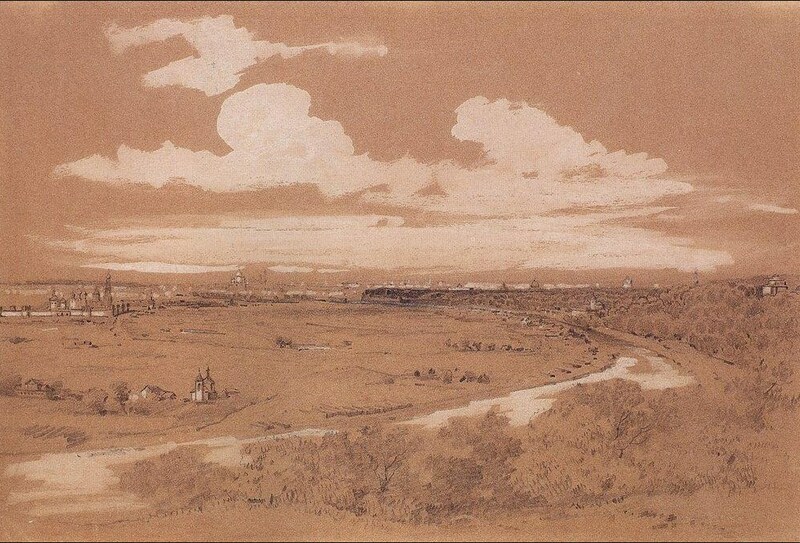 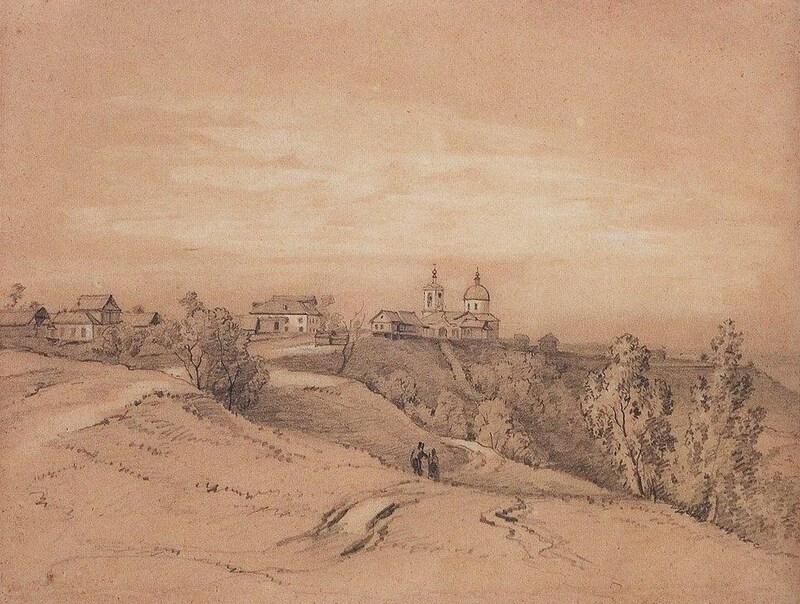 The artist’s youthful works—View of Moscow from Vorobyovy Hills (1848, TRETYAKOV GALLERY, MOSCOW) and View of the Kremlin in Inclement Weather (1851, TRETYAKOV GALLERY, MOSCOW) — therefore betray the influence of Roman­ticism, but they are distinguished by real ob­servation and sincerity of feeling. 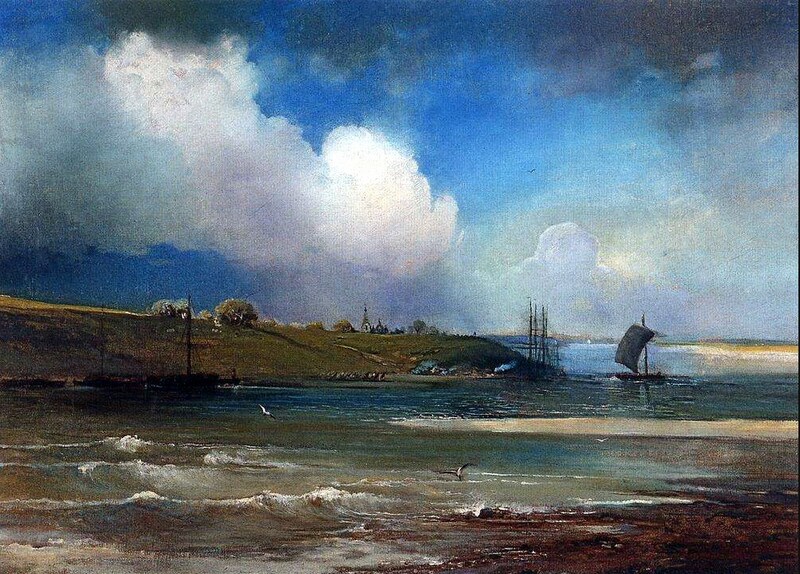 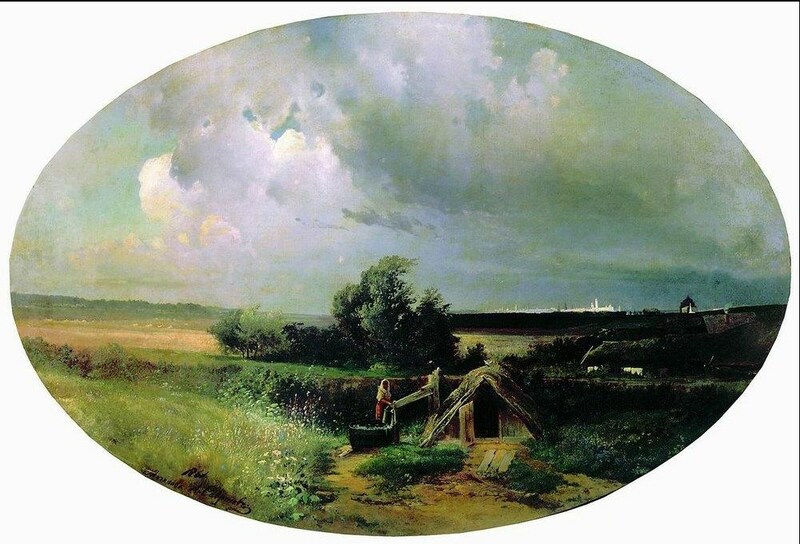 In the summer of 1854 the artist worked near St. Petersburg on the Gulf of Finland. 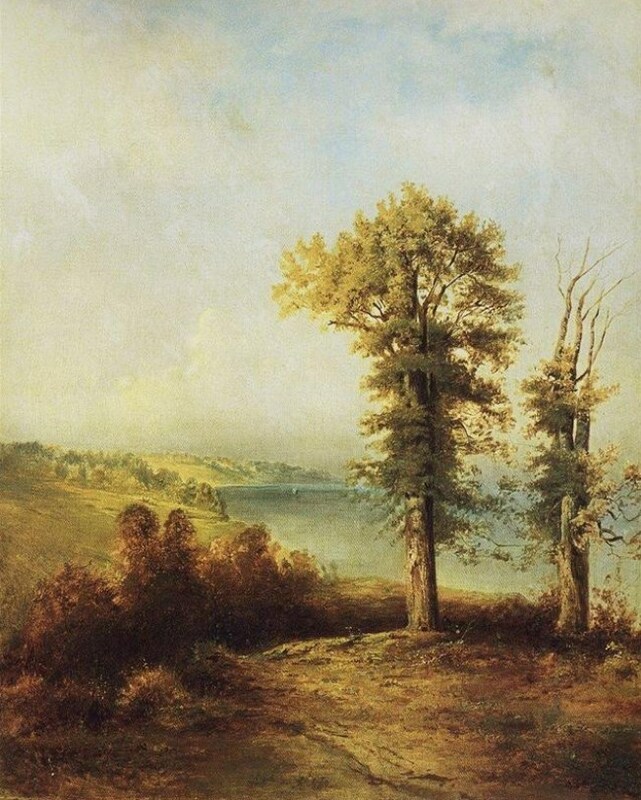 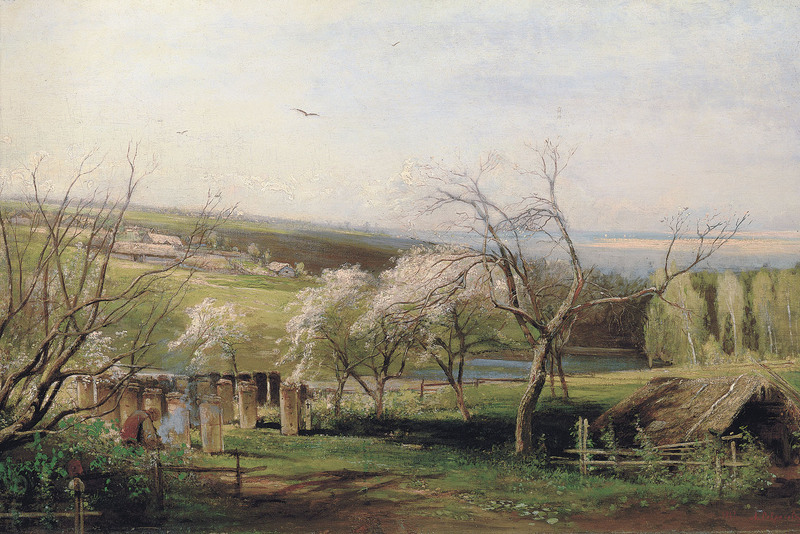 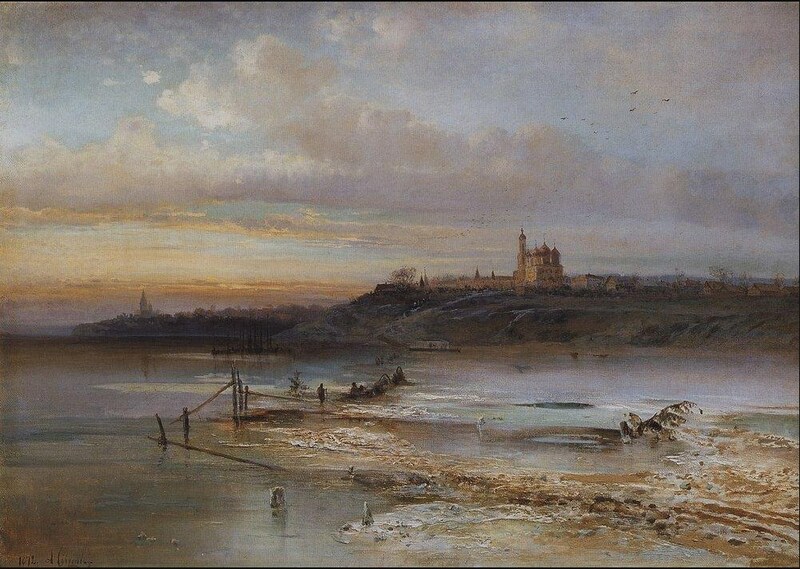 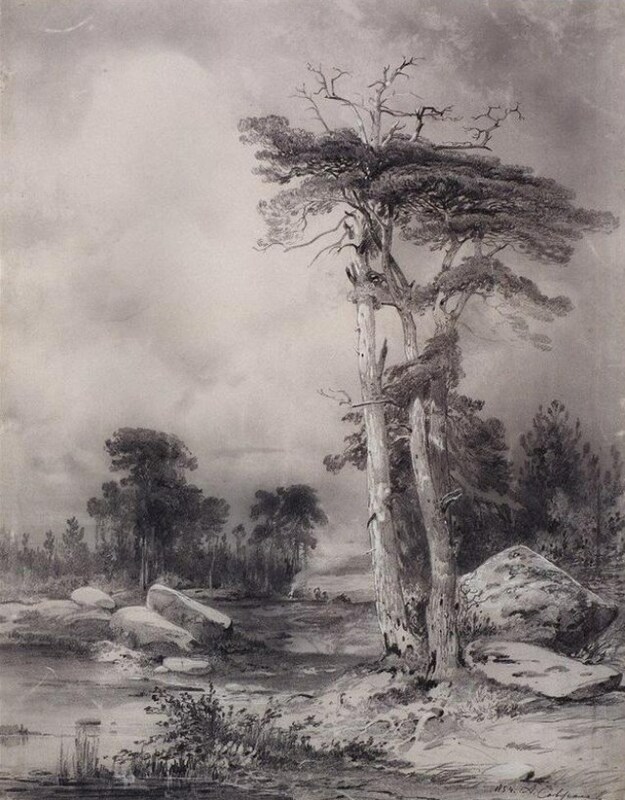 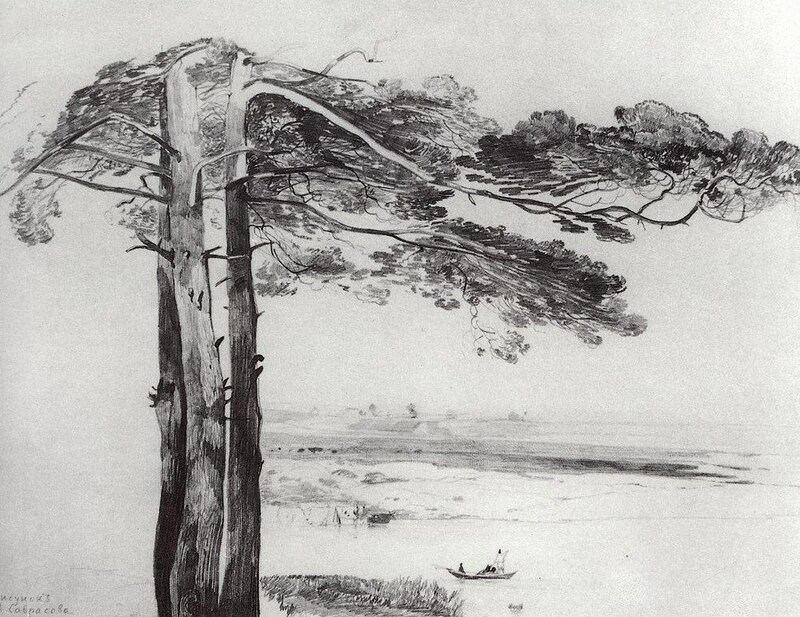 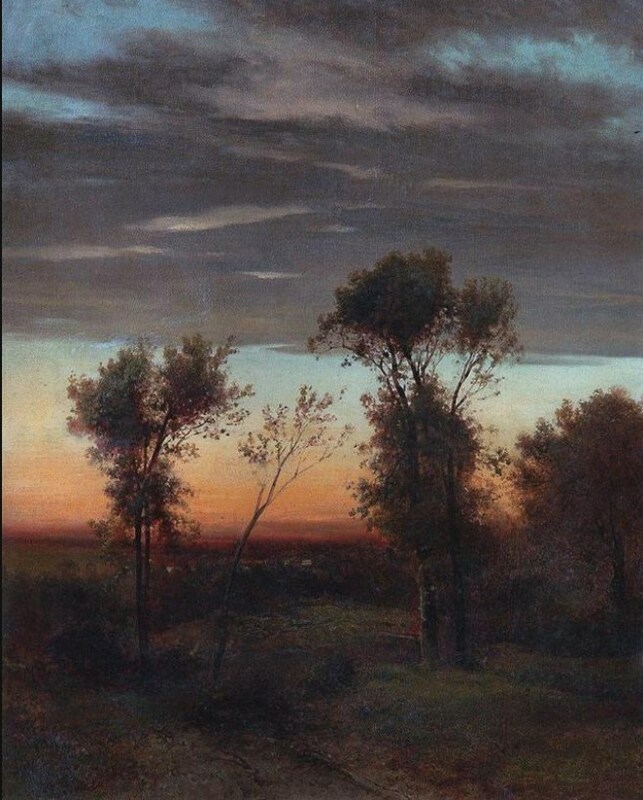 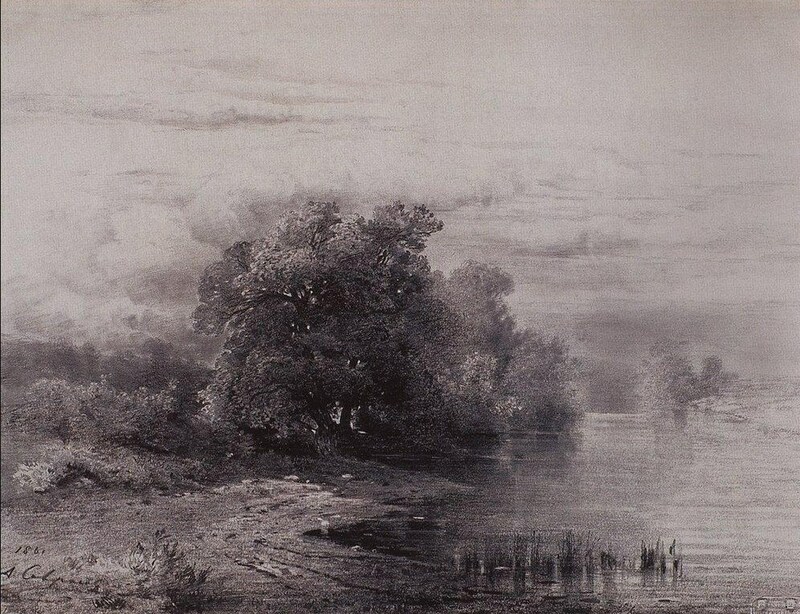 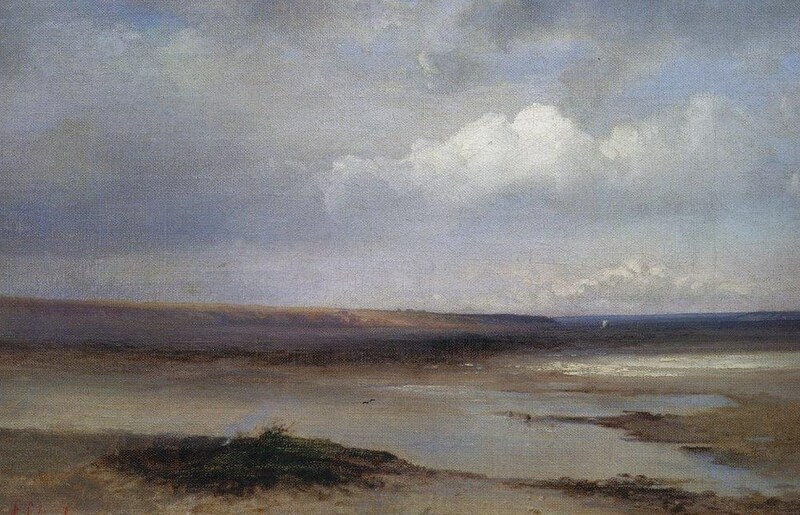 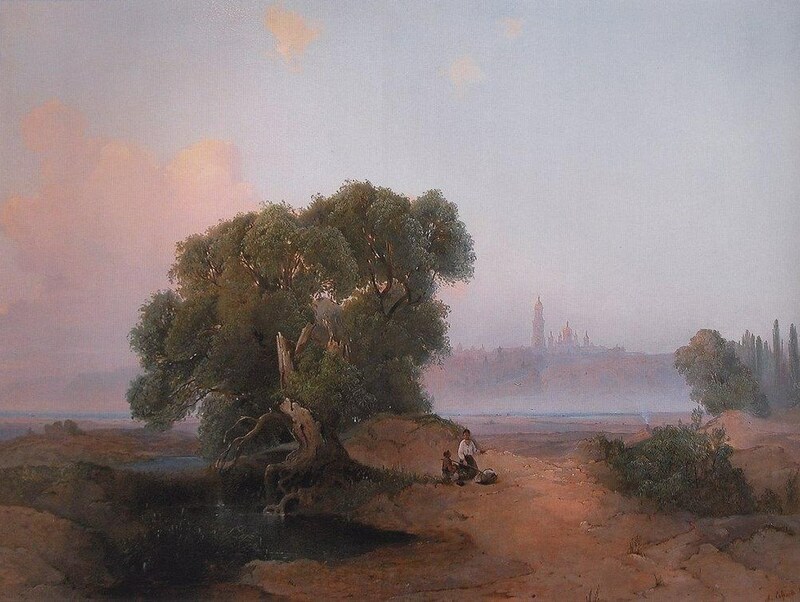 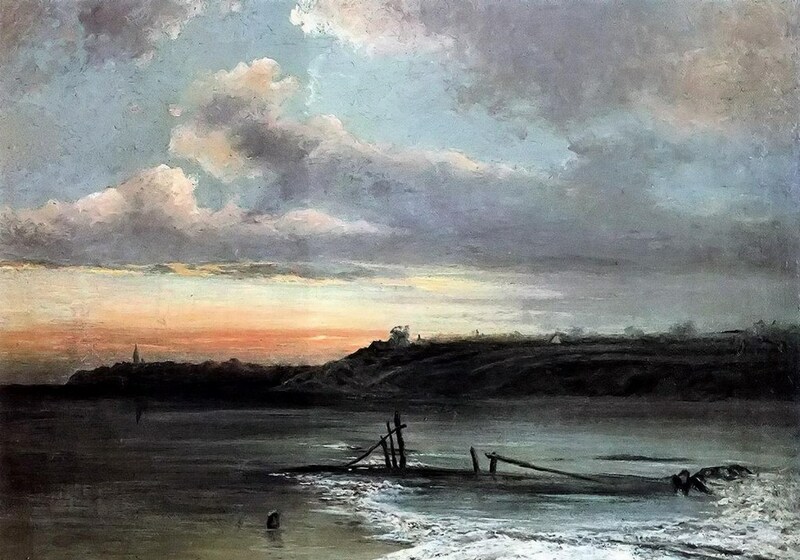 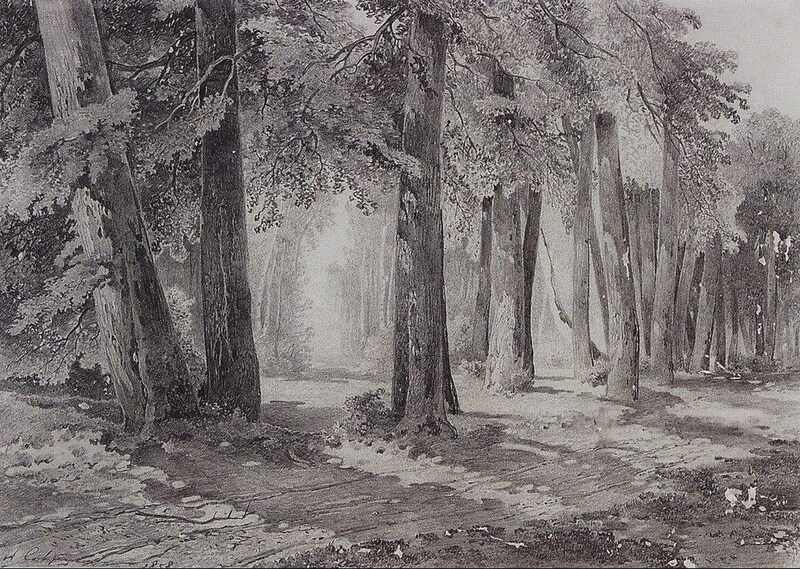 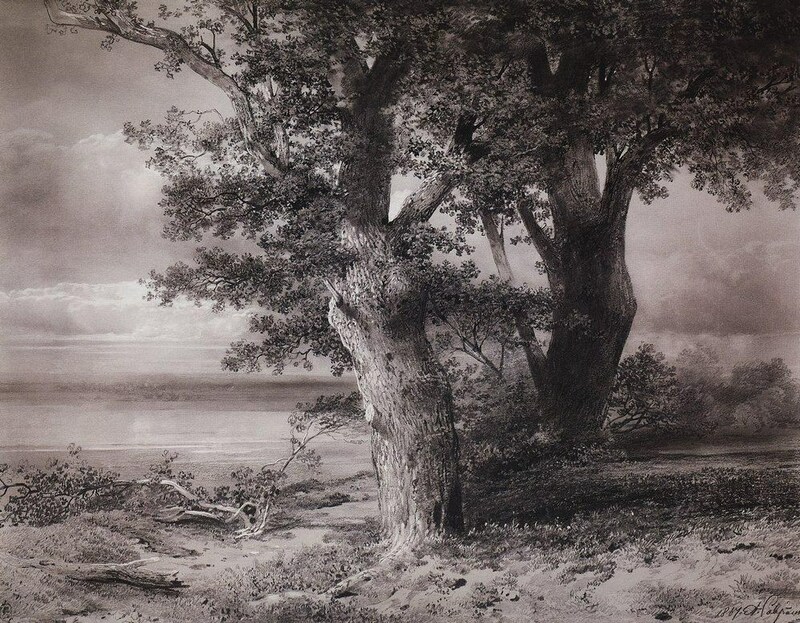 Two of his paintings which drew attention at an autumn exhibition at the Academy of Arts (6 October 1854)—View in the Environs of Oranienbaum and Coastline in the Environs of Oranienbaum —brought Savrasov the title of academician. 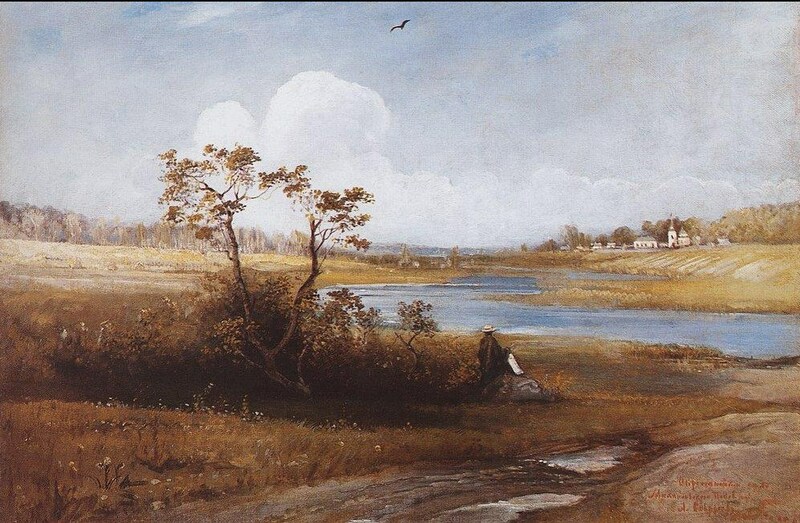 Both of these paintings differ substantially from his earlier works. 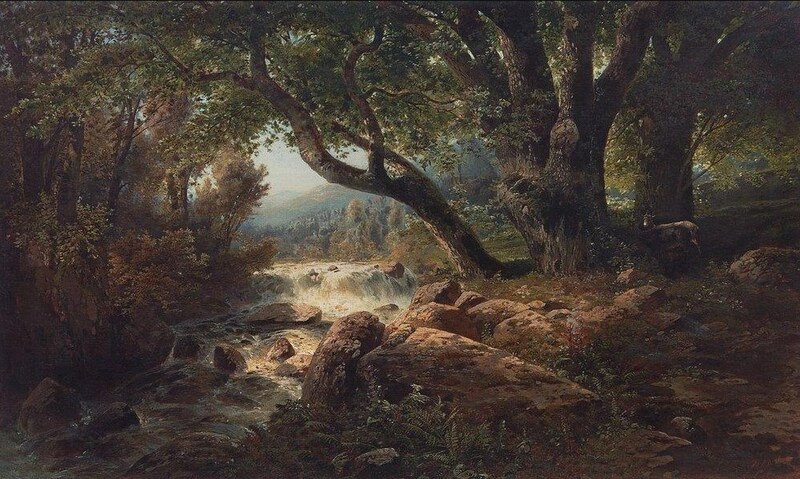 Having selected a tradi­tional romantic motif, the artist sought poetry not in superficial effects but in lyrical reproduction of nature. 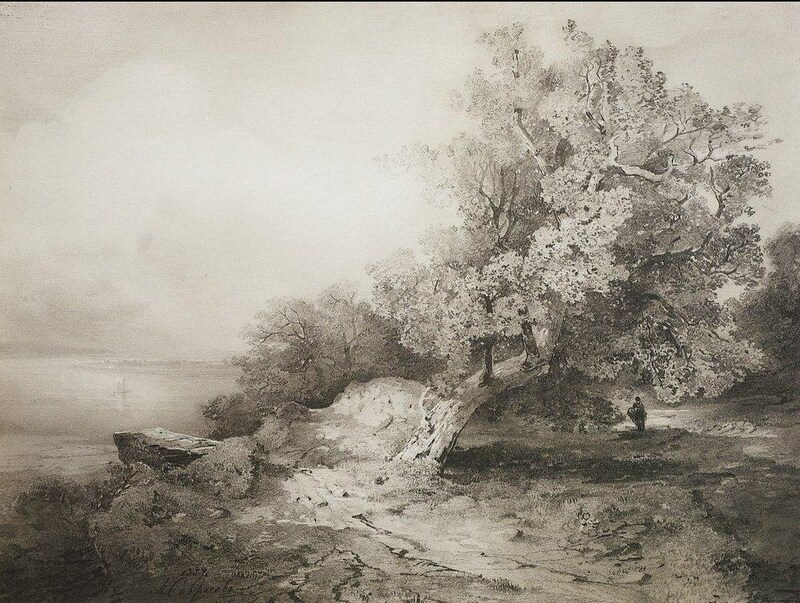 With great affection he describes the charm of a summer evening at the sea, the moistness of the sea air in the shade of ancient rocks, and the twilight under the spread­ing branches of trees. 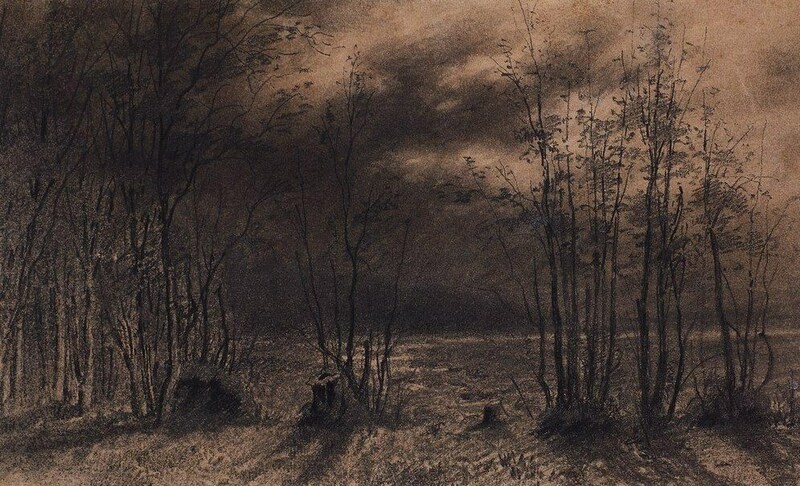 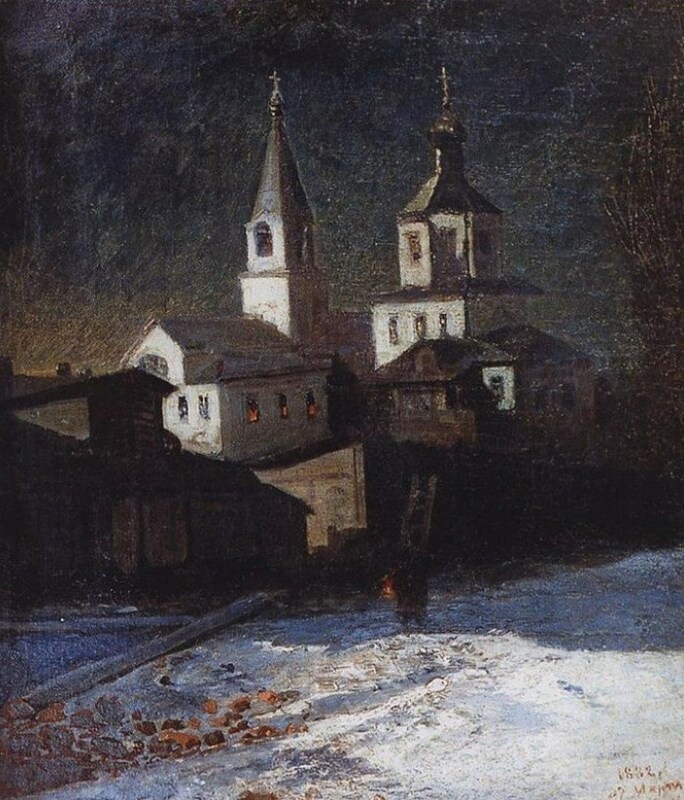 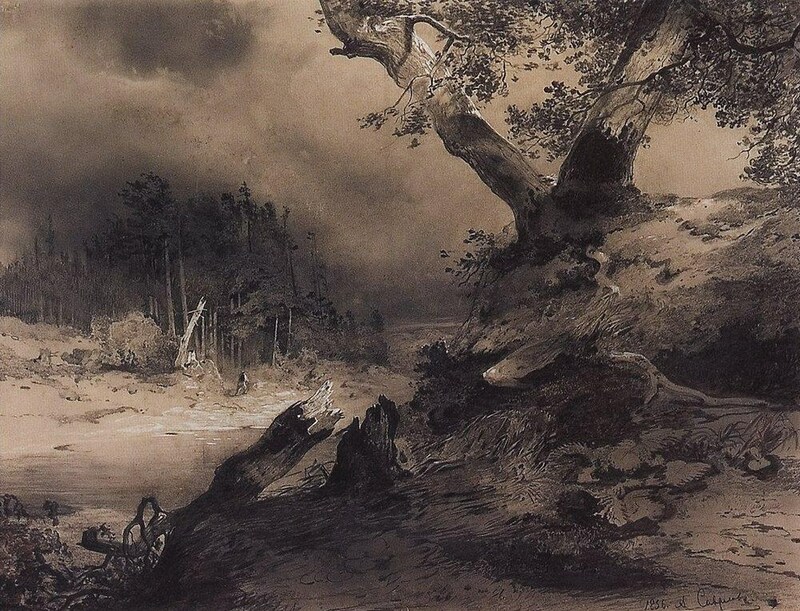 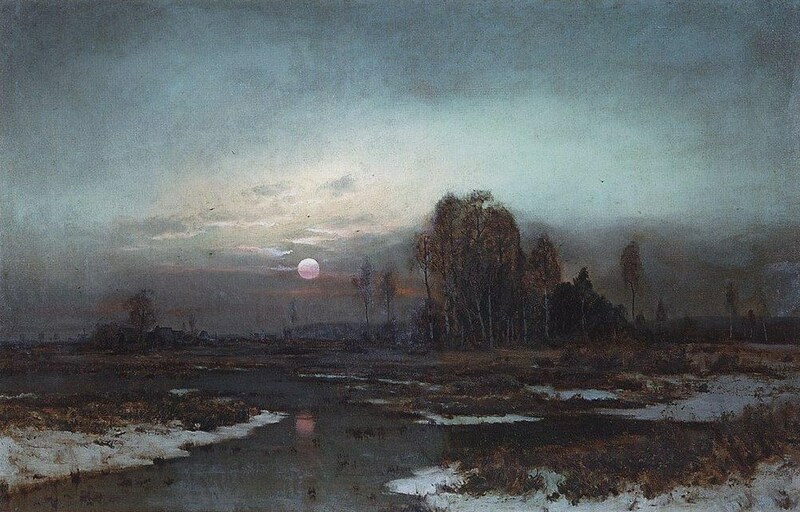 In Moscow Savrasov again took part in exhi­bitions at the School of Painting and Sculpture, and after his teacher’s death in 1857 he took over the landscape class. 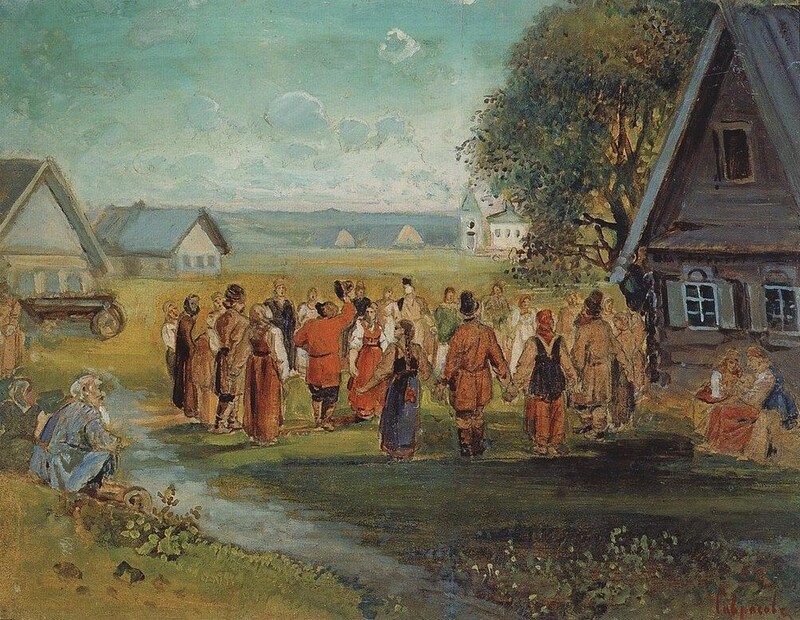 His teaching went well and he soon found himself surrounded by affectionate friends and pupils. 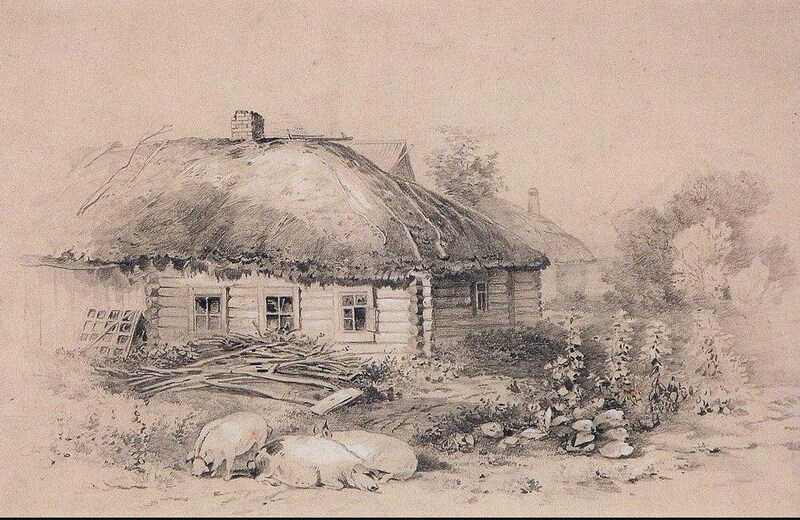 Also in 1857 he married Sofia Herz, the sister of a well-known archeologist and art historian. 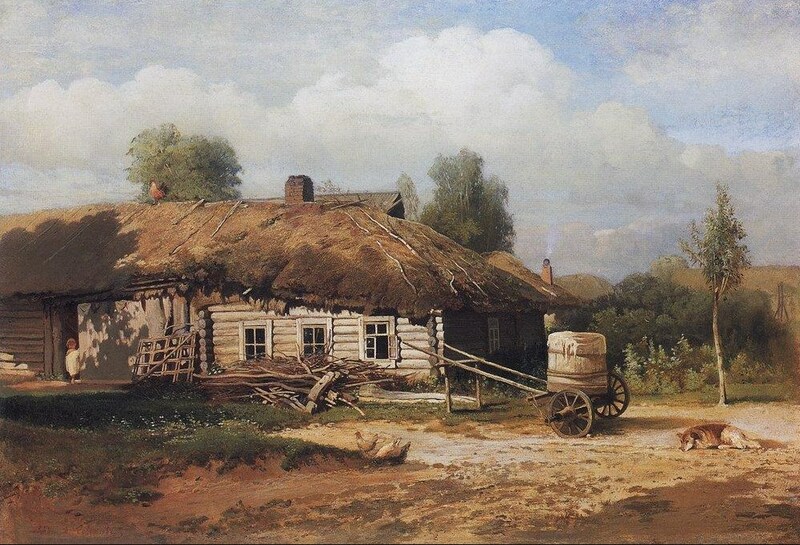 Their house became a meeting-place for artists and art-patrons (including Pavel Tretyakov), new works of literature were read, and there were lively discussions of the issues current in Russian society of the day. 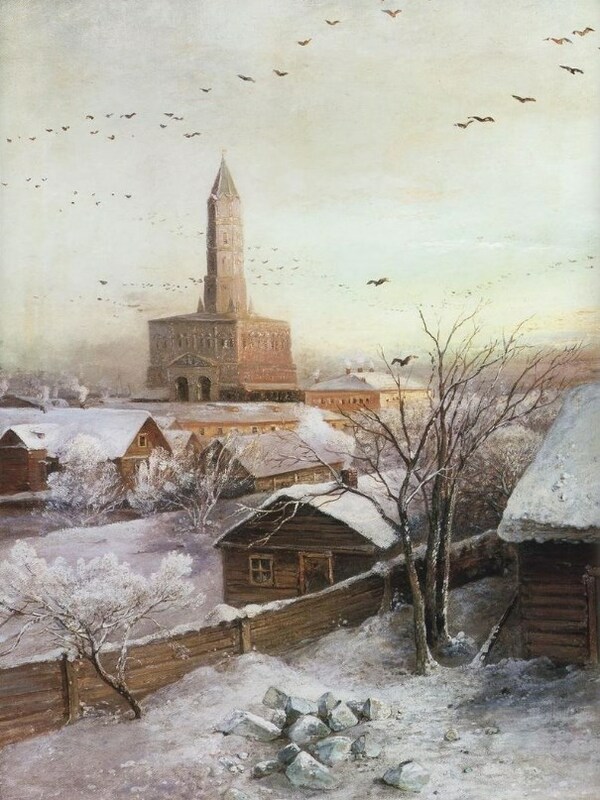 One of Savrasov’s closest friends was Vasily Perov, the initiator of the Peredvizhniki Society. 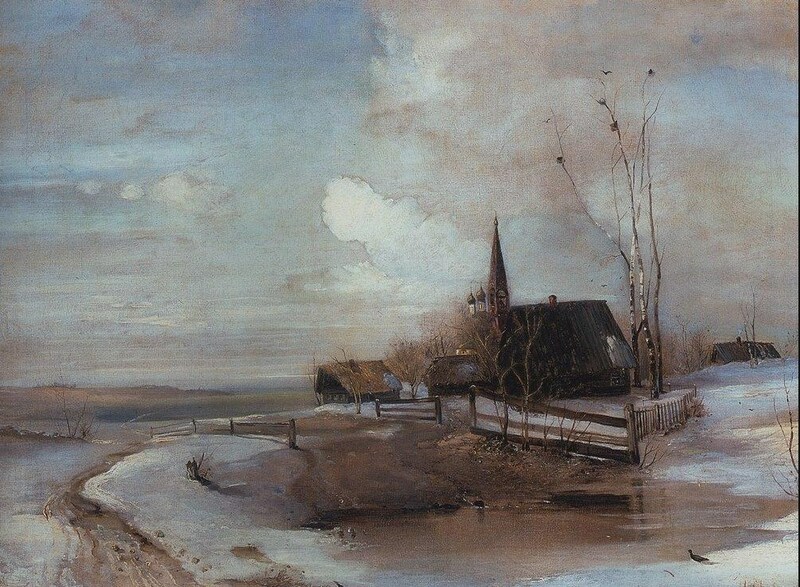 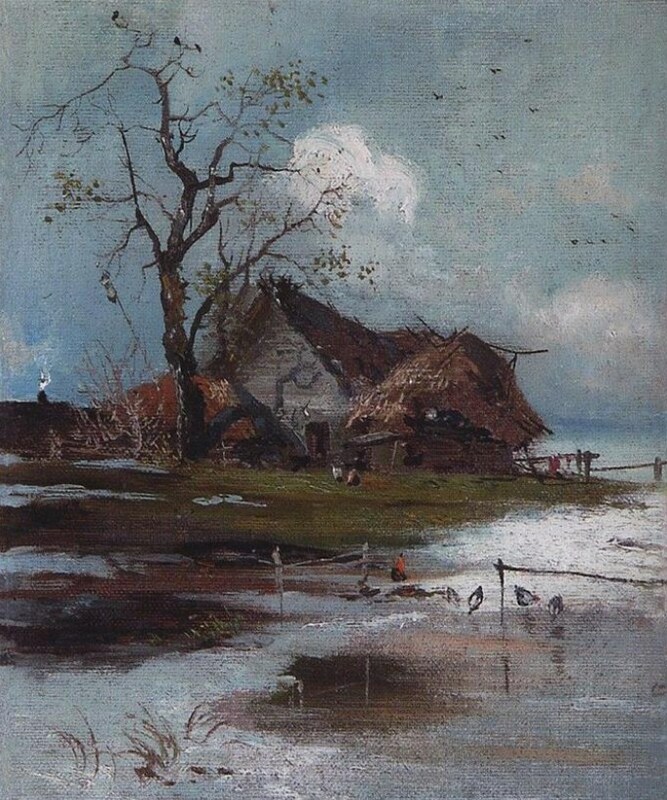 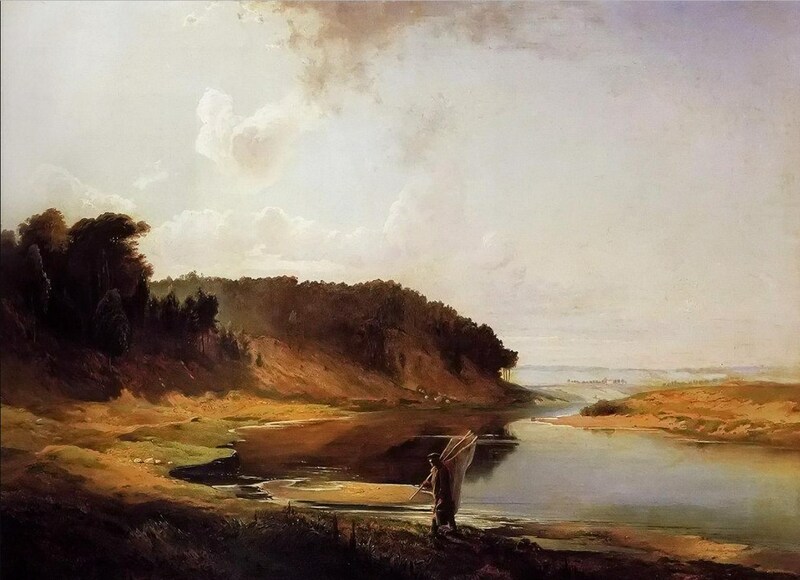 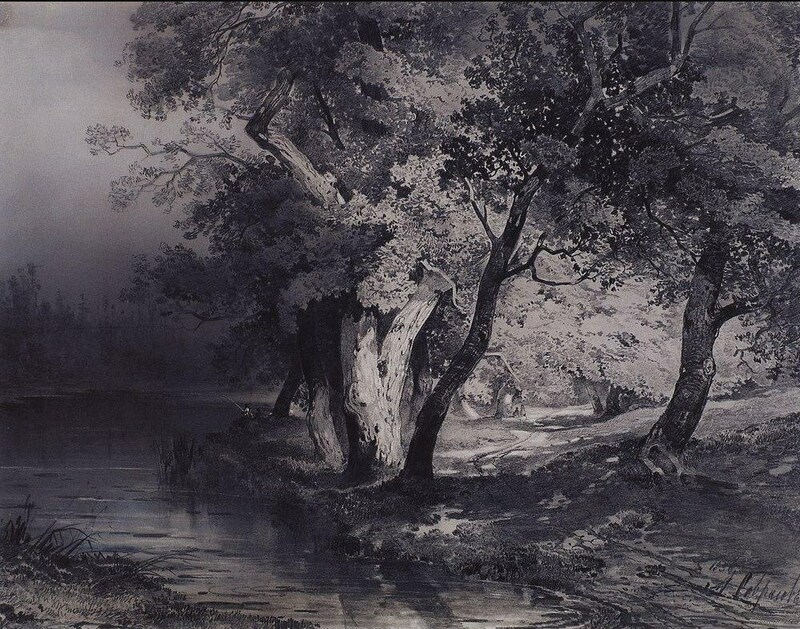 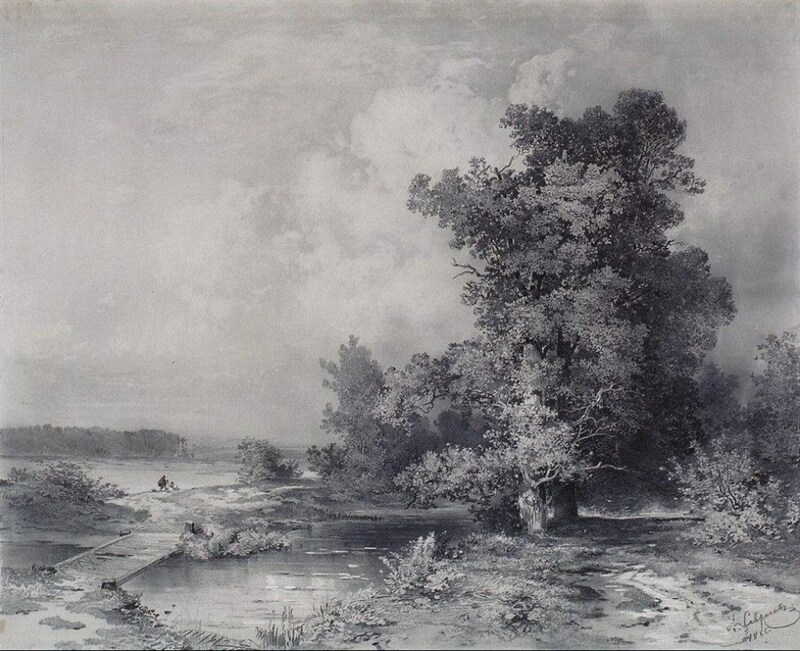 One of the landmarks in Savrasov’s develop­ment as an artist was the painting Landscape with River and Fisherman (1859, State Art Mu­seum of Latvia). 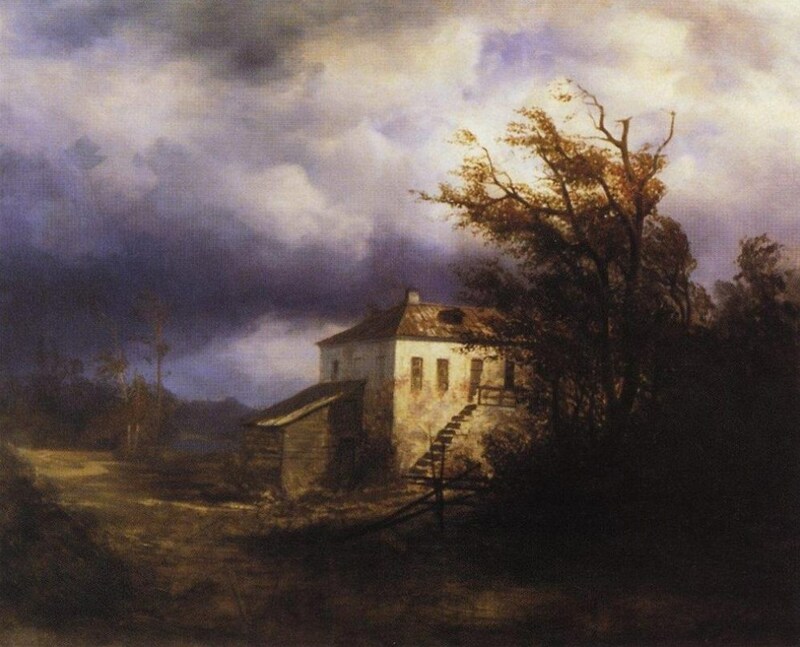 Here there is neither the struggle of the elements nor striking contrasts in lighting. 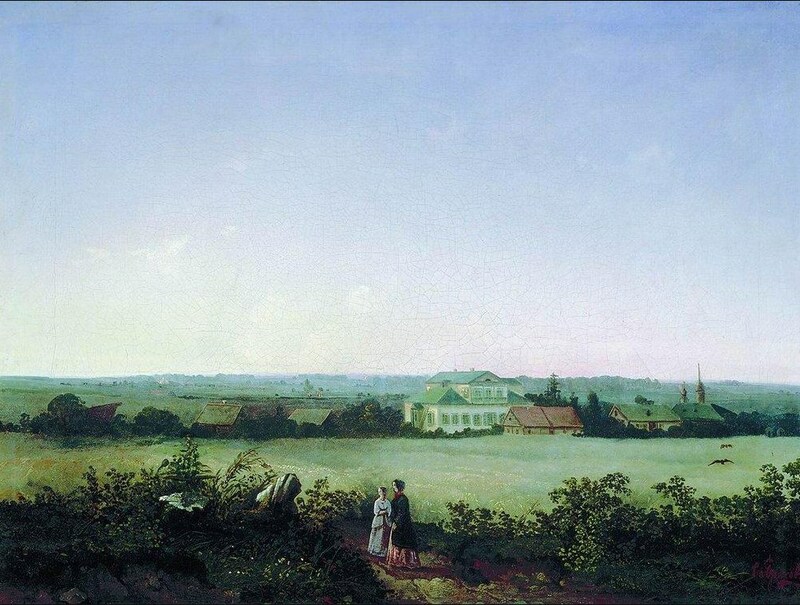 The line of the bank is calm, the silhou­ette of the group of trees is smooth, and the sun­light gently illuminates the suburban Moscow valley. 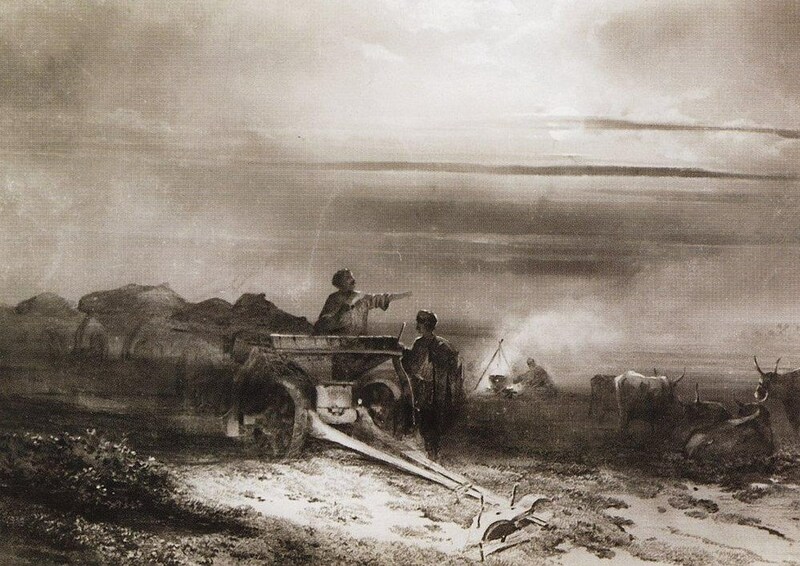 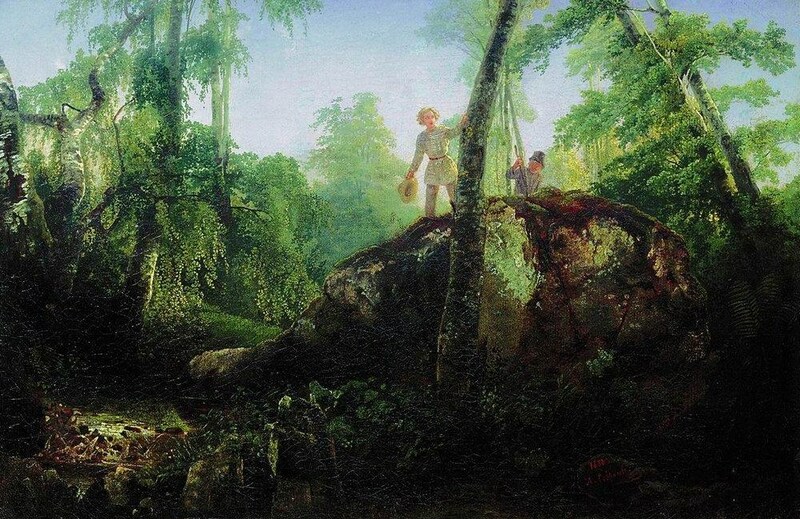 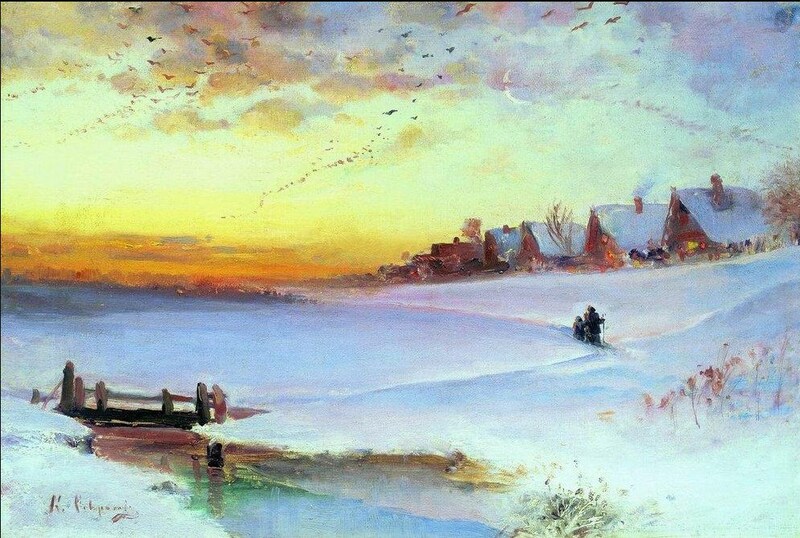 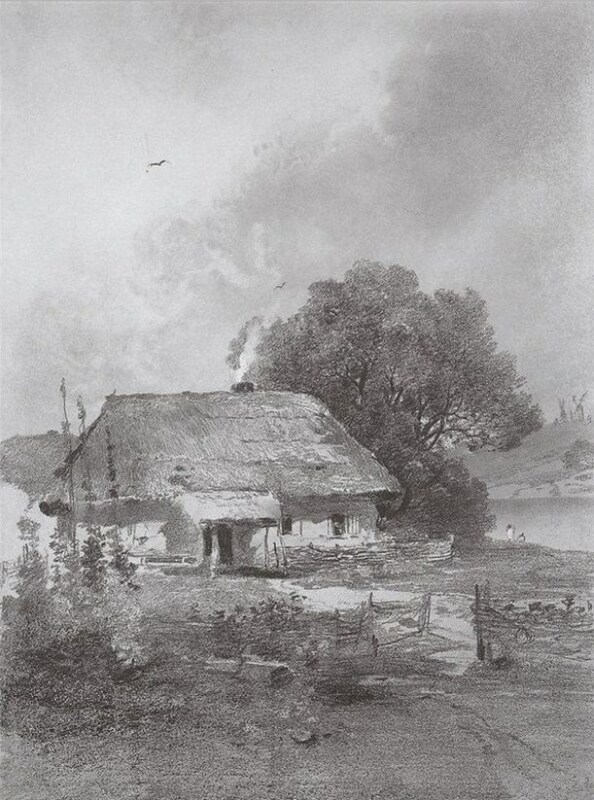 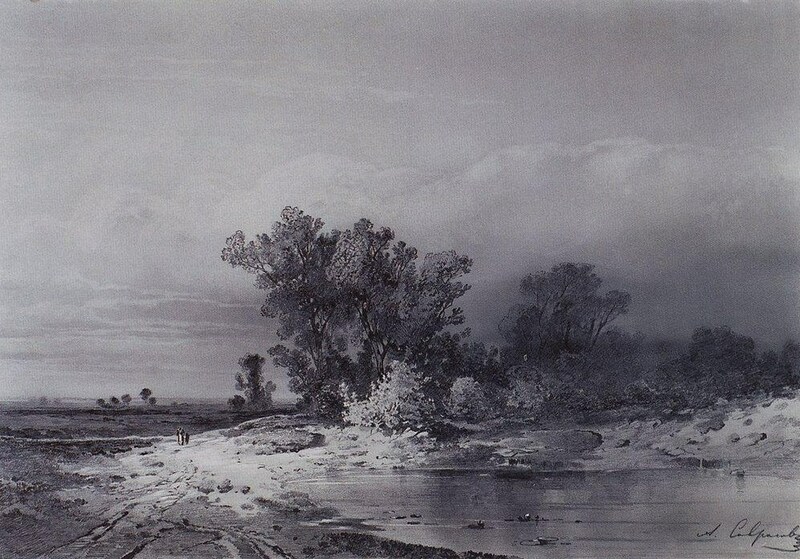 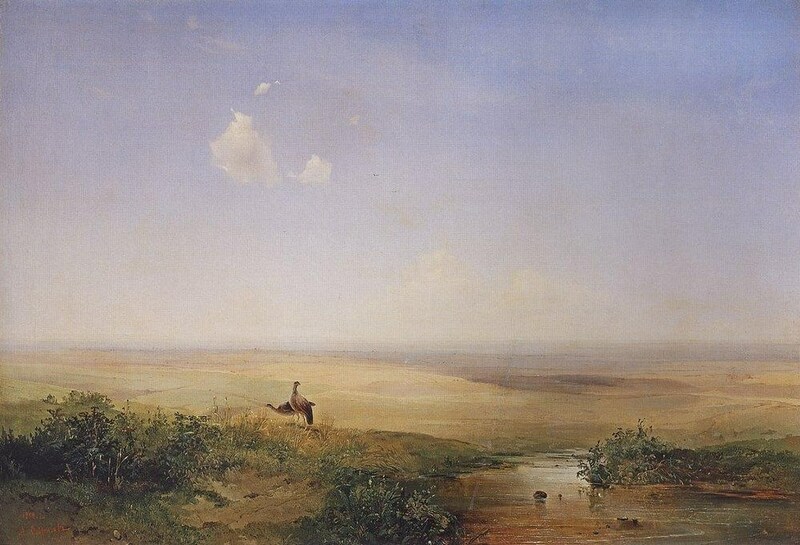 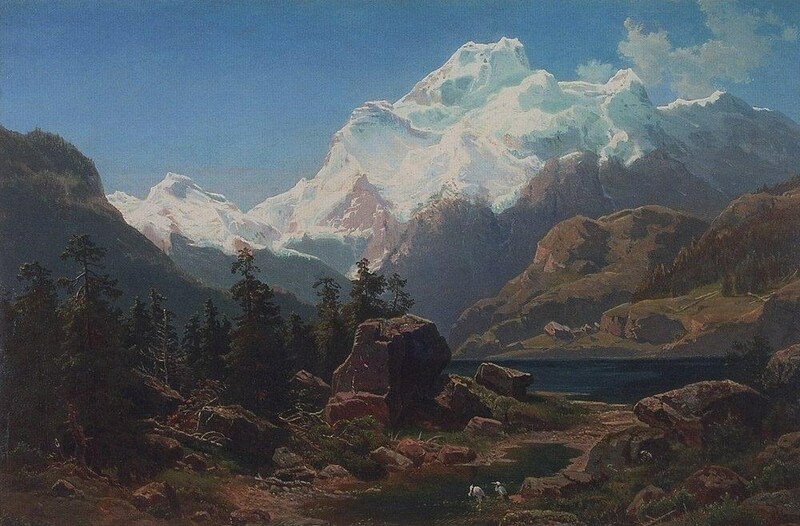 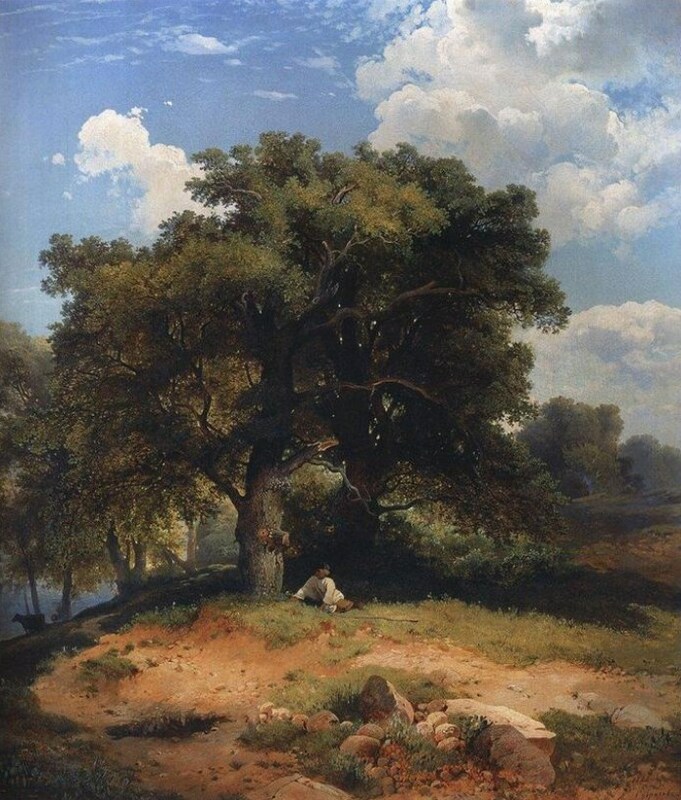 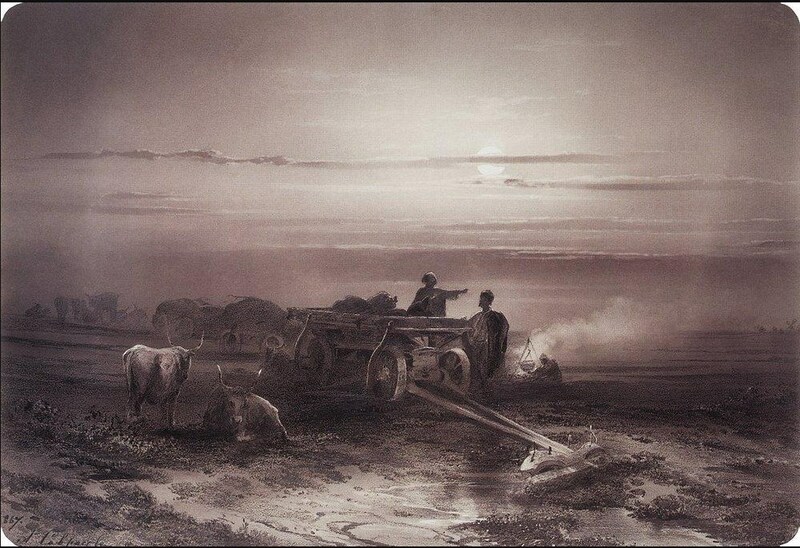 In Russian art, the 1860s were marked by the affirmation of the national characteristics of the Russian landscape. 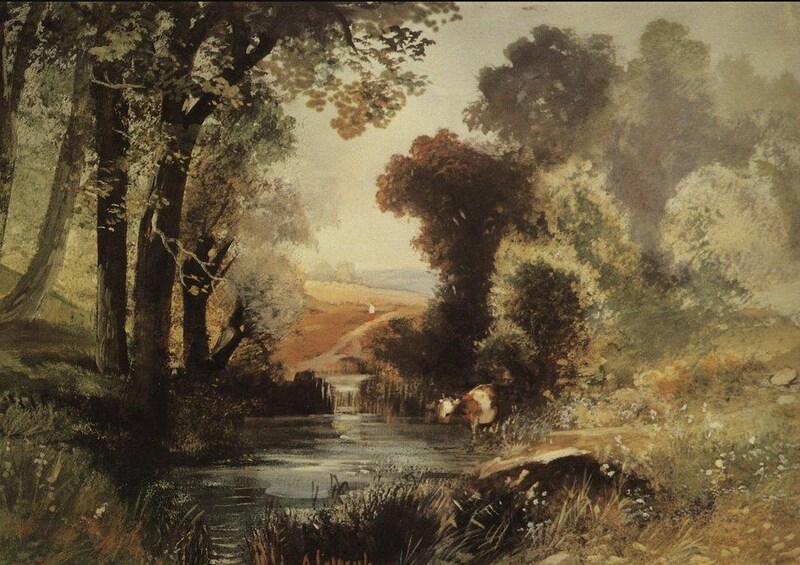 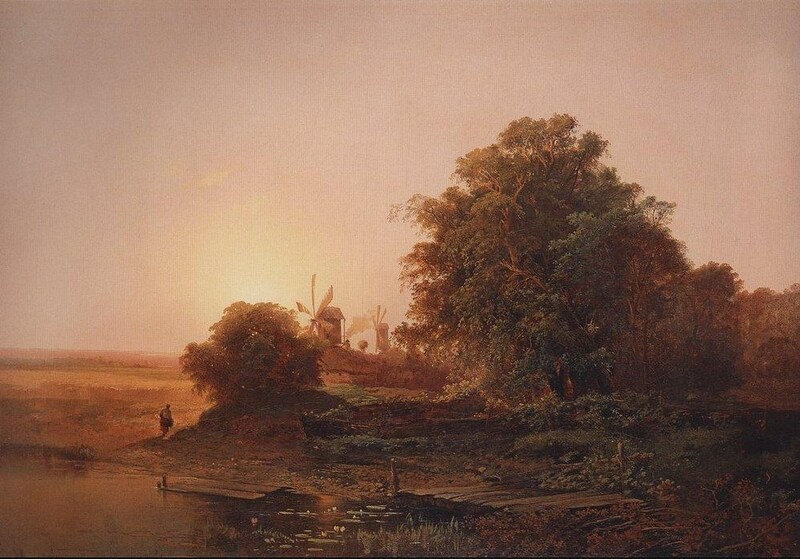 More and more often land- scape-artists turned to the primarily rural area of central Russia, seeking to give an authentic impression of the beauty of their native land. 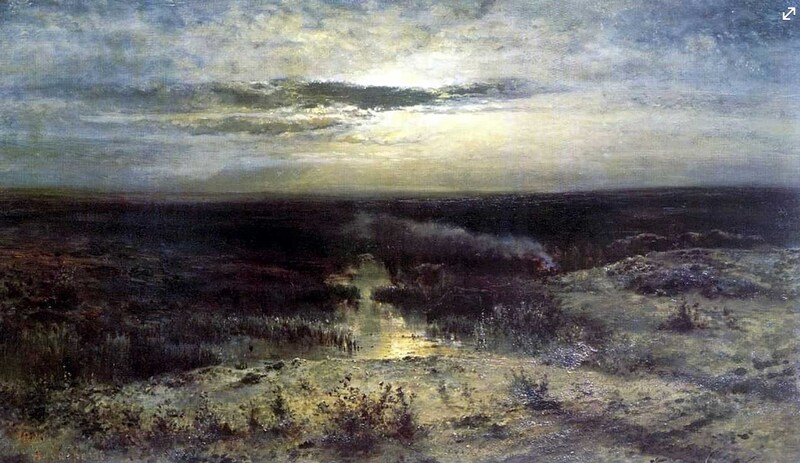 Savrasov did a lot of work in the environs of Moscow, like View of the Village of Kuntsevo (1855, TRETYAKOV GALLERY, MOSCOW), Evening Landscape (1861, State Art Museum of Latvia), Rural View (1867, TRETYAKOV GALLERY, MOSCOW). 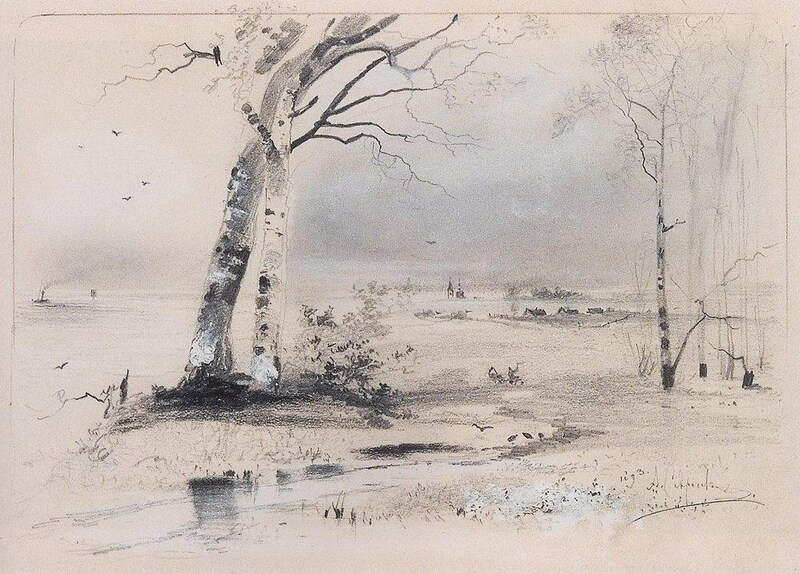 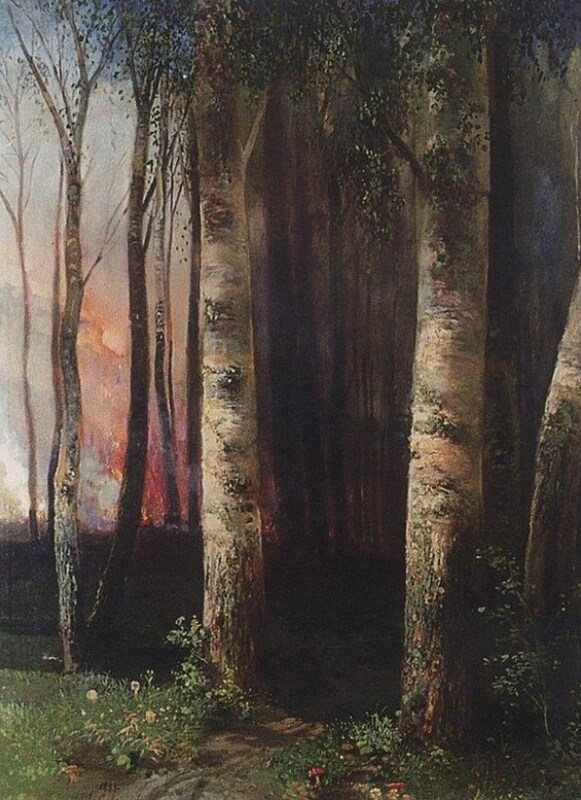 In the spring of 1862 the Society of Art Lov­ers offered Savrasov a trip abroad, and he visited the World Art Exhibition in London, went to Co­penhagen, Berlin, Dresden, Leipzig, Paris, Mu­nich, and spent two months in the mountains of Switzerland. 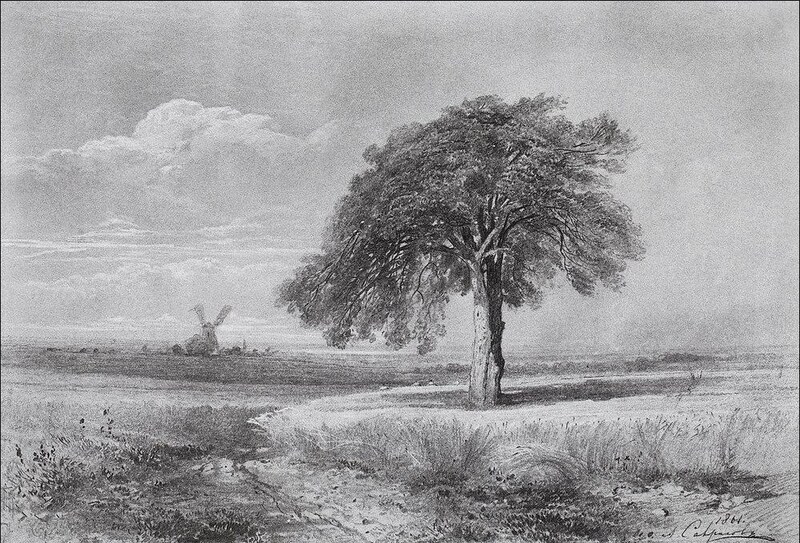 He expressed admiration of the Eng­lish and German masters’ ‘aspiration for truth and independence’. 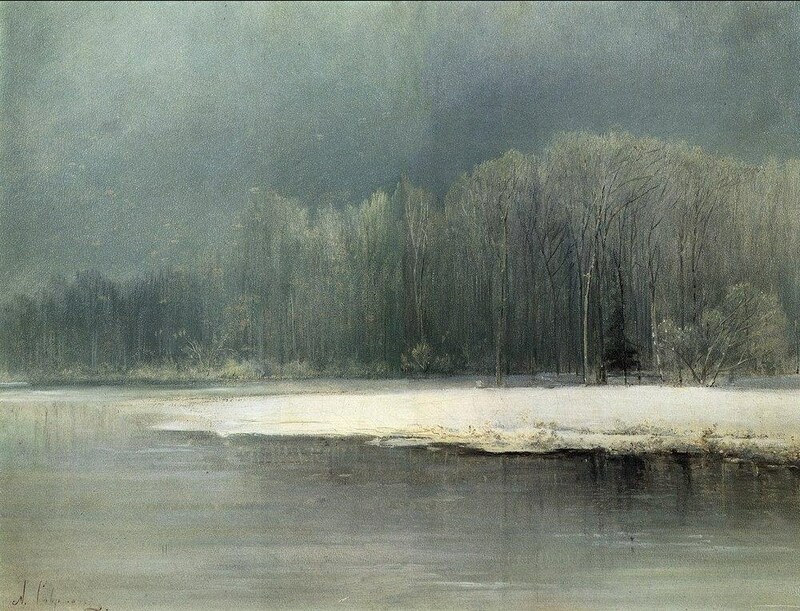 Savrasov’s most important work of the sixties was ElkIsland (1869, TRETYAKOV GALLERY, MOSCOW), which won first prize at a competition organised by the Moscow So­ciety of Art Lovers. 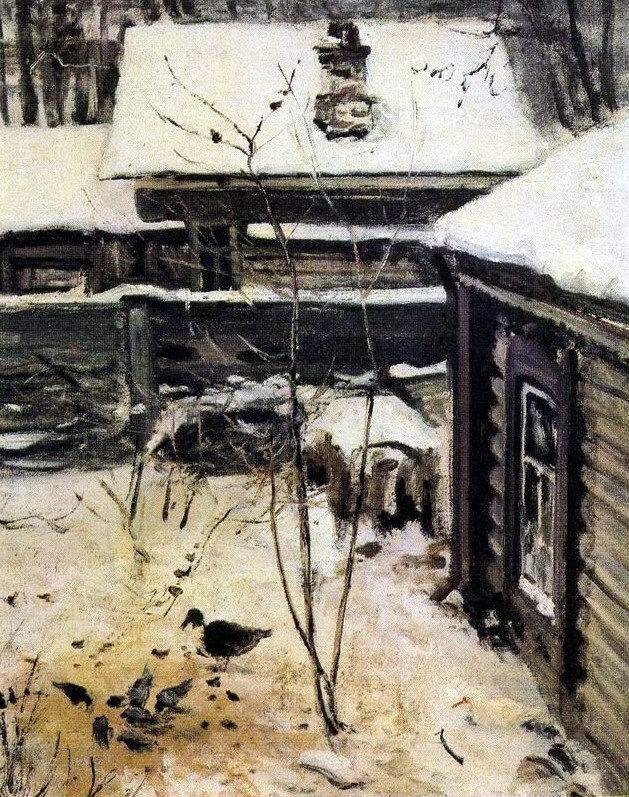 One of his contemporaries commented on his ‘ability to transfer to the can­vas a piece of the nature we all know so well, from the vicinity of Moscow’. 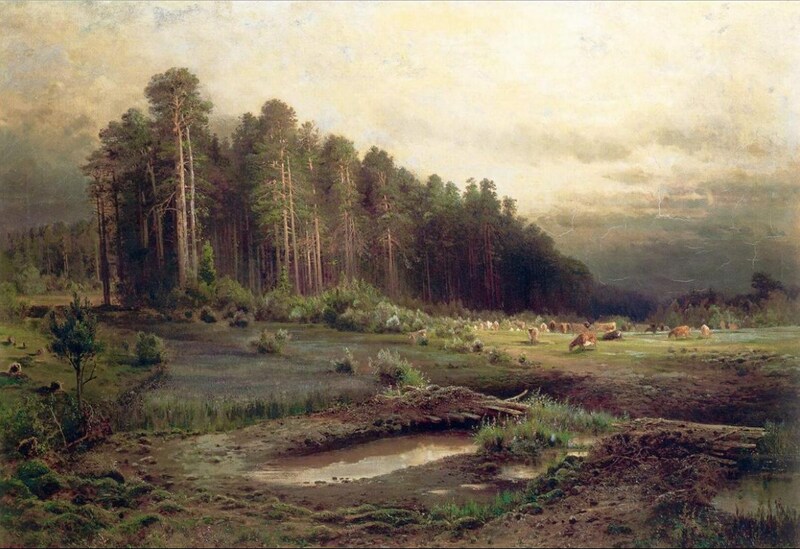 A solemn and maj­estic pine forest stands like a guardian over the spreading fields: it is a clear summer day; a herd grazes peacefully in the meadows. 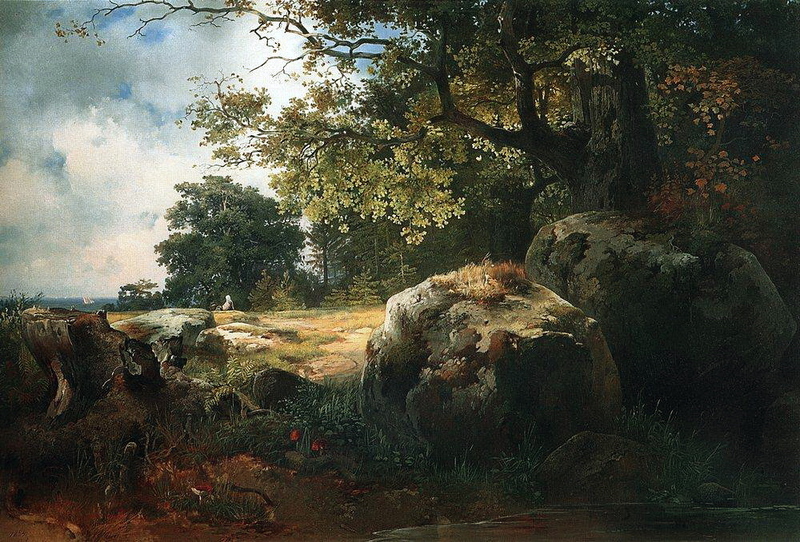 The land­scape is complete down to the last detail—the bushes, the trees, the grass in the forest clearing. 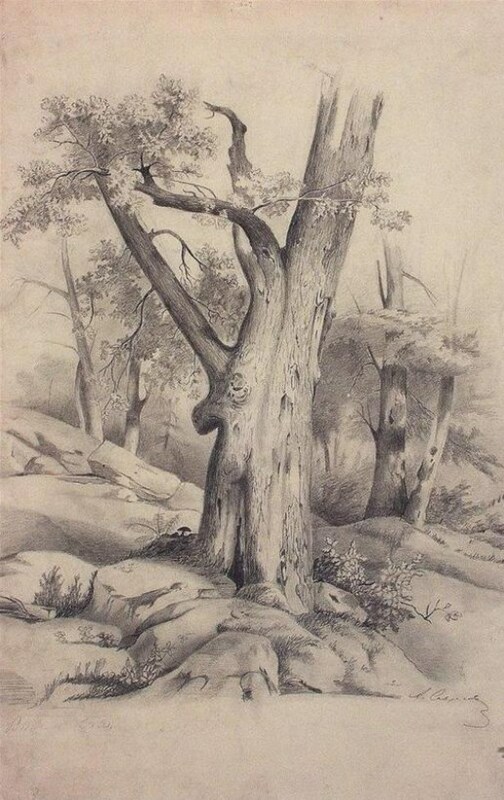 The artist pinpoints here what is significant in the commonplace in nature. 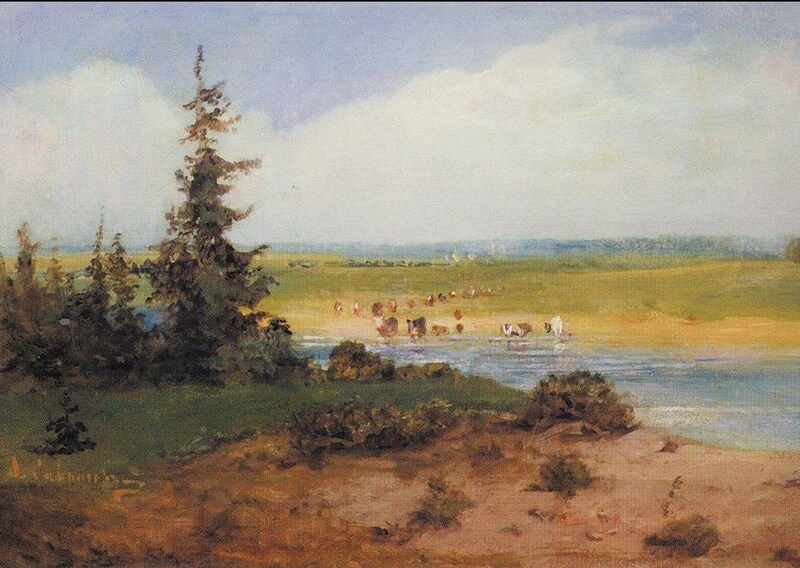 Elk Island marked the beginning of the artist’s prime, and the fol­lowing years saw the creation of his finest works. 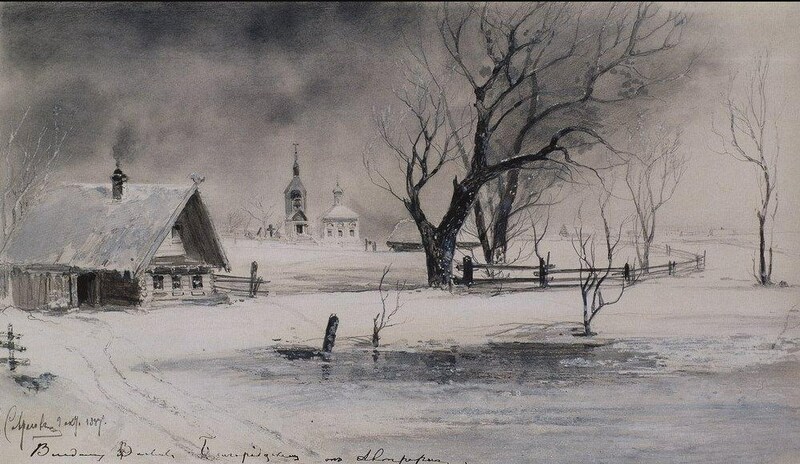 In December 1870 Savrasov and his wife travelled to the Volga and stayed in Yaroslavl, near Kostroma, in Nizhny Novgorod and in Yuryevets. 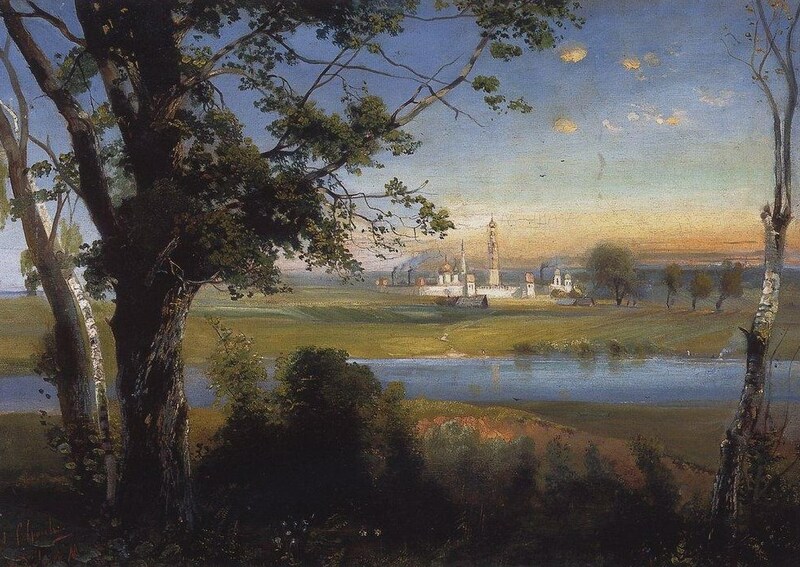 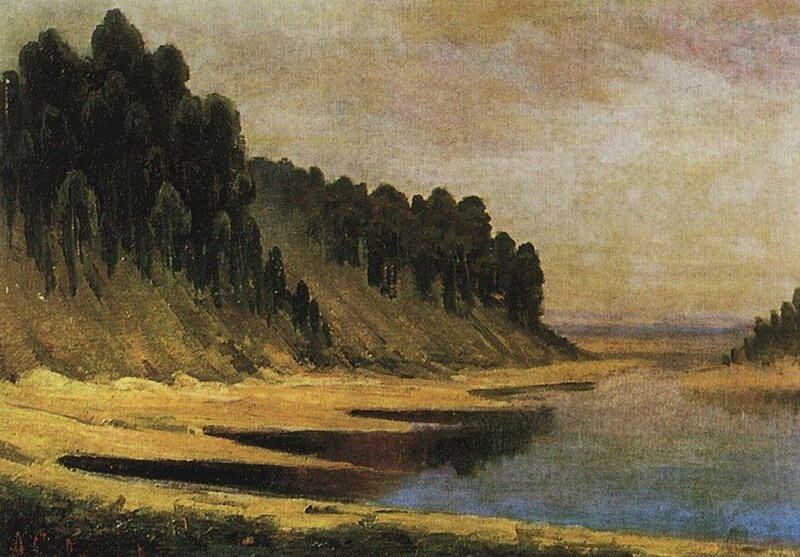 The painting Pechersky Monastery near Nizh­ny Novgorod (1871, GorkyStateArt Museum) is one of Savrasov’s largest works and the first of his well-known Volga landscapes. 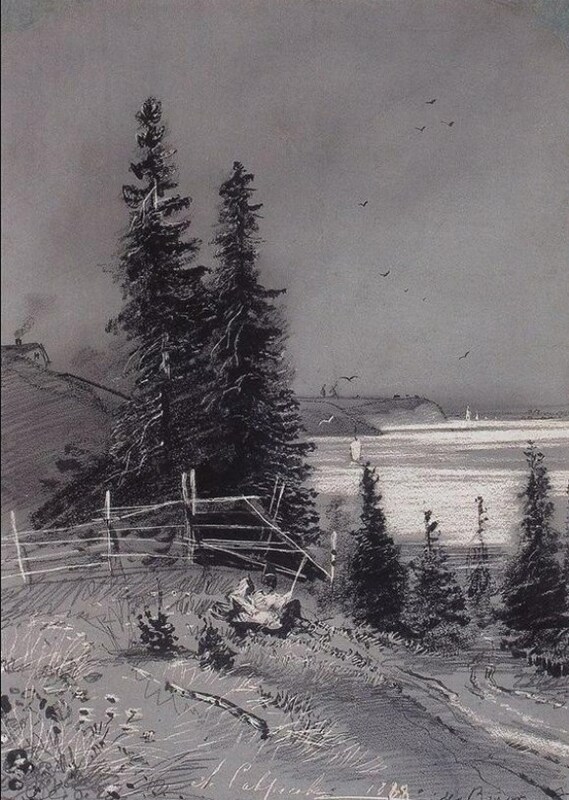 He was utter­ly won over by the solemn grandeur and expan­siveness of the Volga countryside, and by its or­ganic unity with the life of the Russian people. 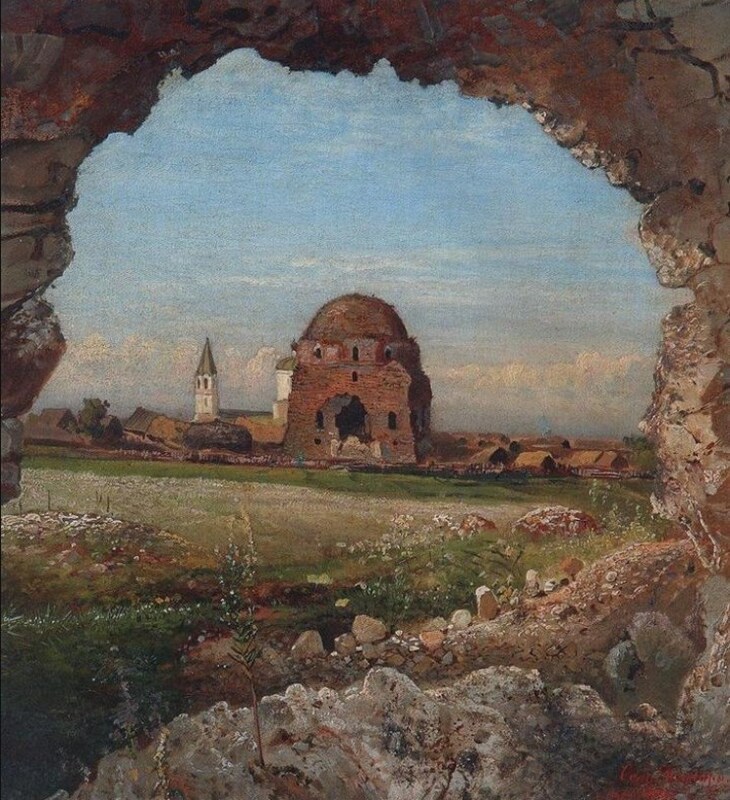 Village houses and gardens, green meadows, blue lagoons and sand banks are all woven quite naturally into the broad panorama, and above it all rises a white-stone monastery. 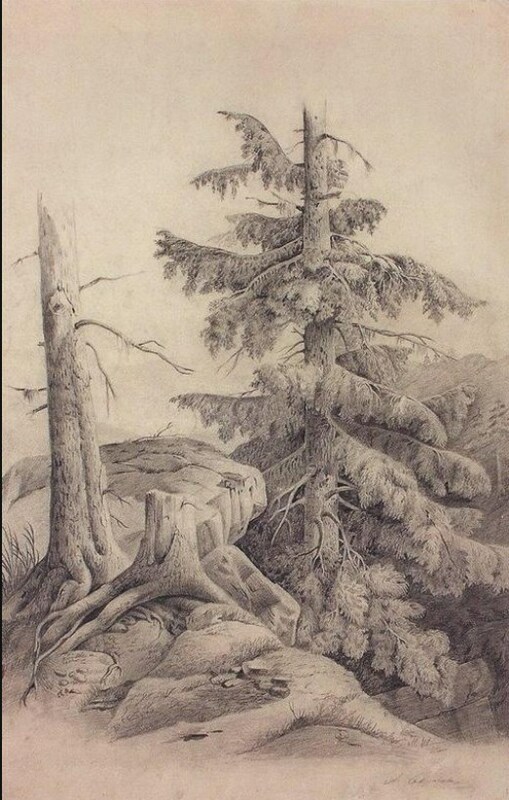 Man and na­ture in the picture are one. 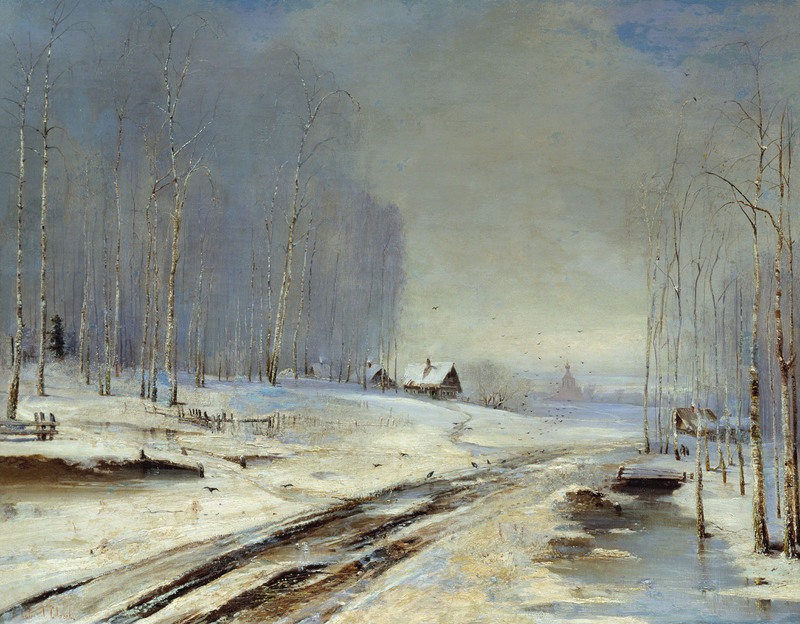 ‘The quiet life at Yaroslavl allows me to con­centrate on art,’ wrote the artist to Pavel Tretya­kov. 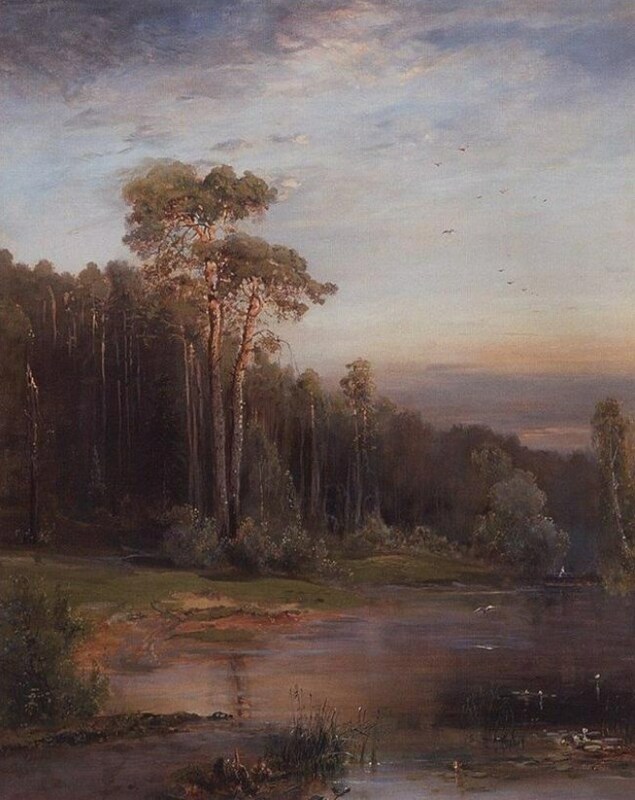 New paintings followed on each other’s heels—The Volga by Yuryevets (1871, where­abouts unknown), The Volga in Spate by Yaros­lavl (1871, RUSSIAN MUSEUM, SAINT PETERSBURG), and finally The Rooks Have Come (1871, TRETYAKOV GALLERY, MOSCOW) which appeared at the First Peredvizhniki Exhibition and was given a rap­turous reception. 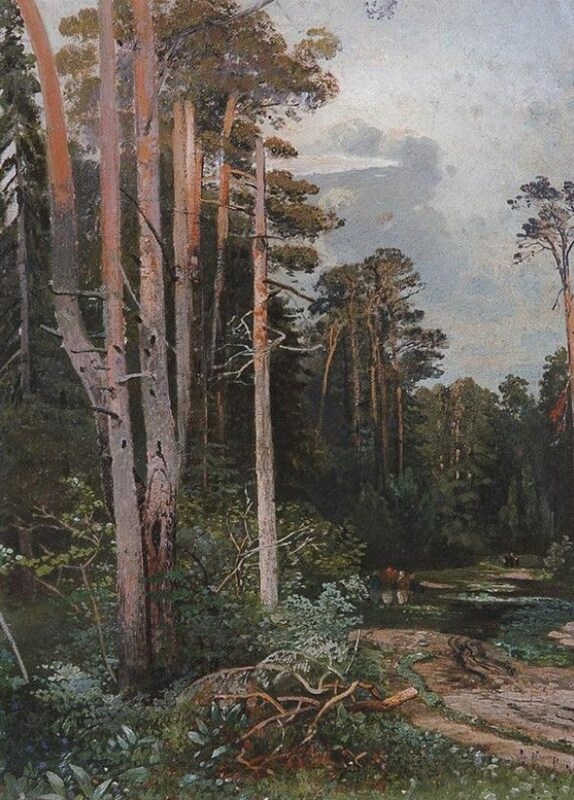 The actual painting of the picture was pre­ceded by sketches from nature, which the artist did in Yaroslavl and in the village of Molviti- novo near Kostroma. 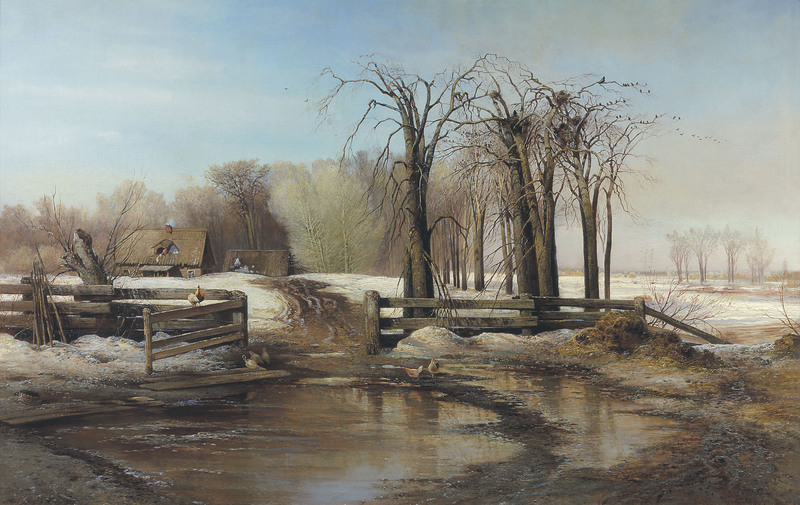 The subdued, delicate col­ouring, comprising gentle shades of grey, brown, white and blue, conveys the iridescent softness of colours in spring. 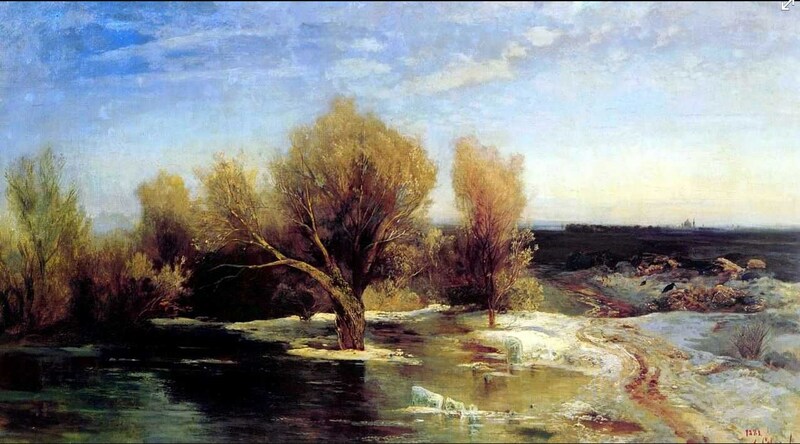 In the north the awakening of nature after the long winter is slow. The snow lies long in the fields, the trees stand frozen in the wind, and suddenly it all fills with a light trem­or of life, with the joyful sound of birds. 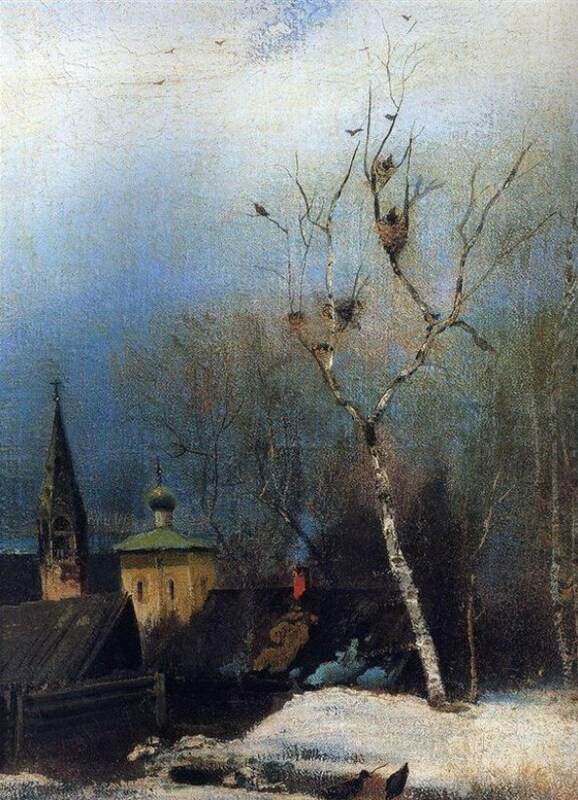 The white-barked birch-trees stretch their slender branches to the clouds and pale sky, buds grow pink and swell in the warm caressing wind, and noisy rooks build their nests. 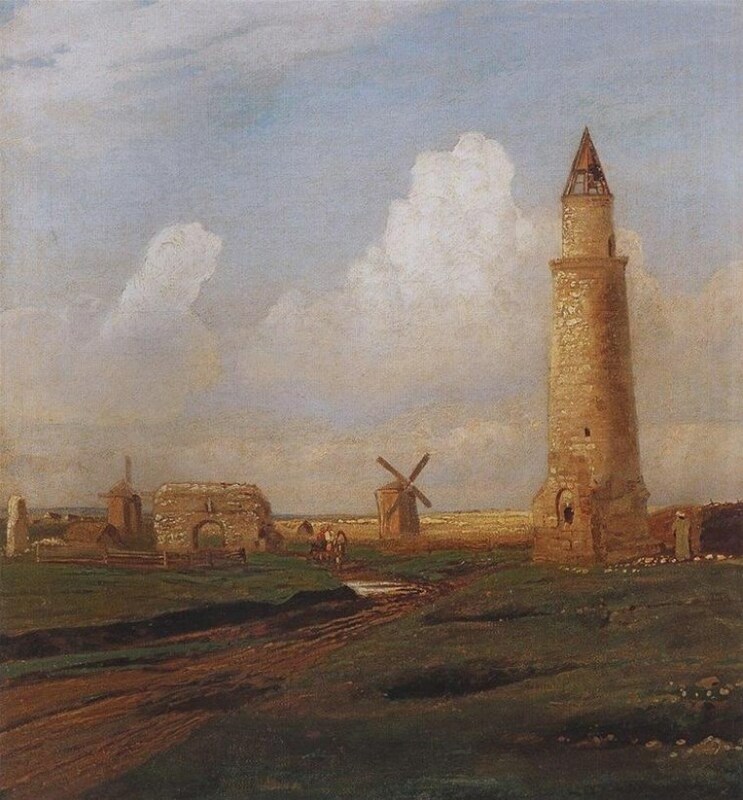 The air is light, clear and springlike, a tall stone church with a pointed bell-tower can clearly be seen, and in the distance a river winds in the broad expanses. 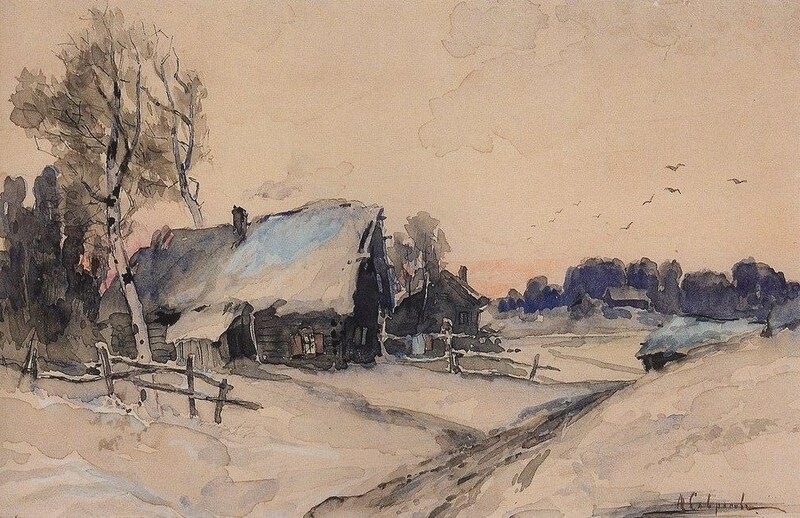 ‘What simplicity!’ wrote Isaak Levitan. 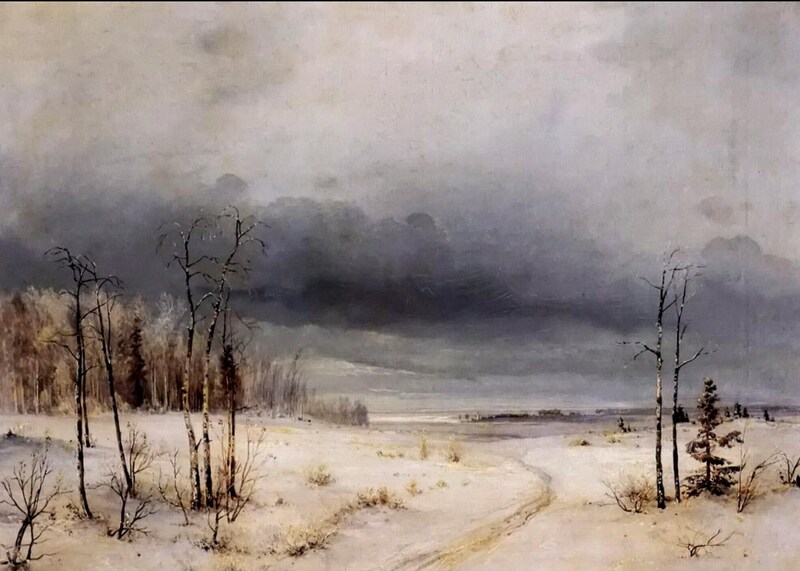 ‘But behind this simplicity one can feel the good and gentle soul of an artist who holds all this very close to his heart.’ No one had ever expressed the beauty and lyricism of the Russian land­scape so profoundly and poetically. 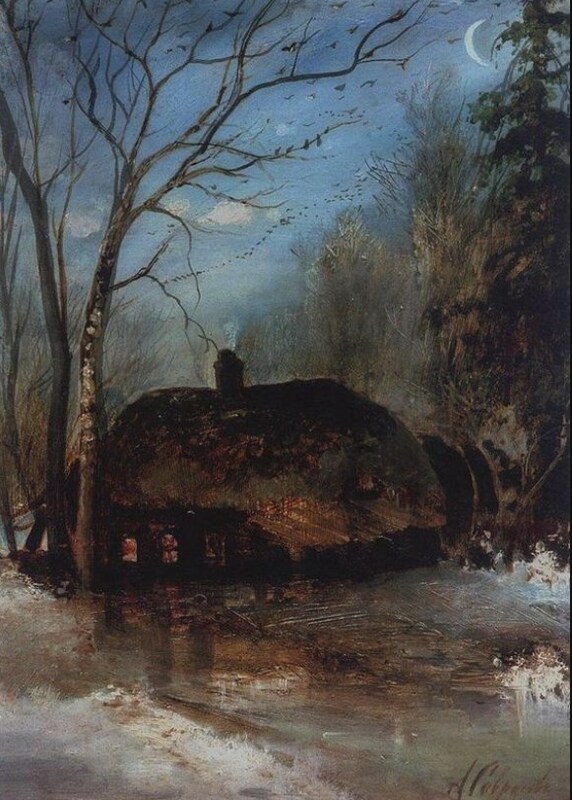 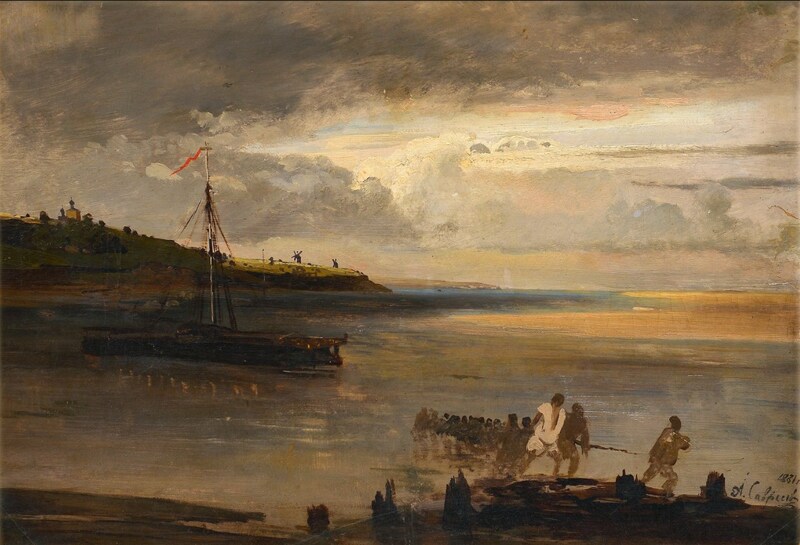 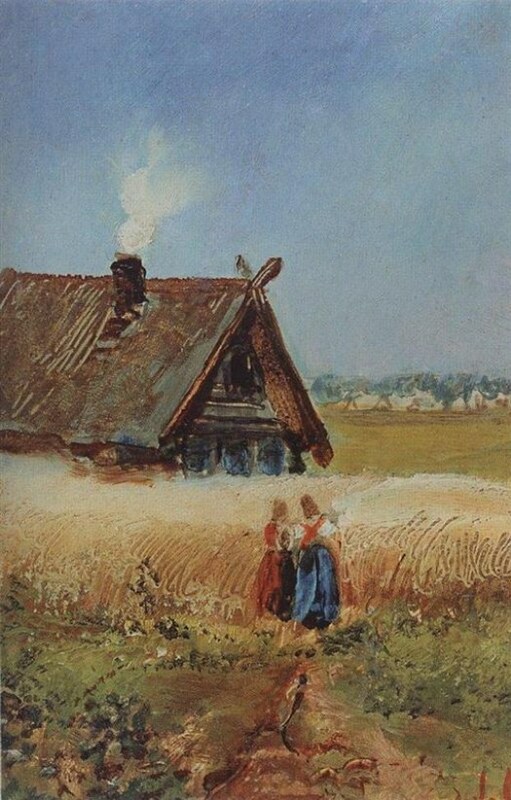 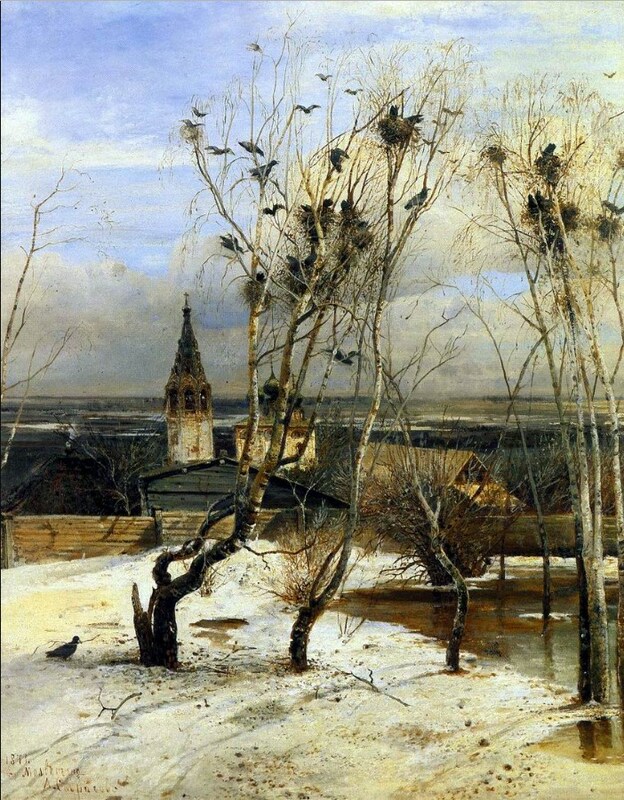 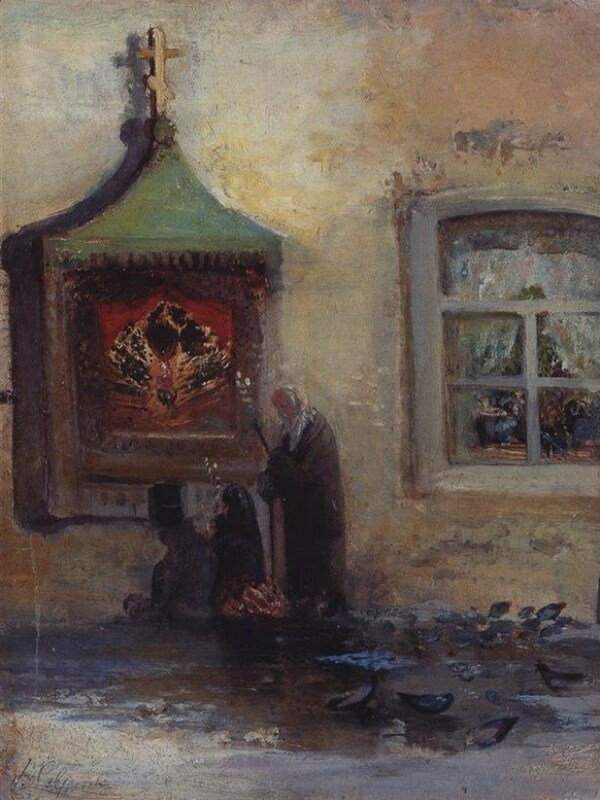 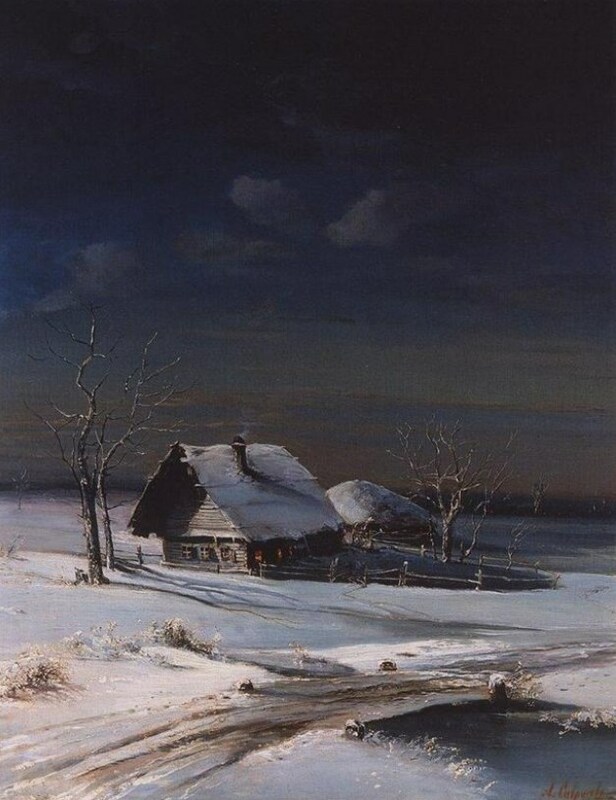 The Rooks Have Come was one of the reasons for the suc­cess of the First Peredvizhniki Exhibition, and from then on Savrasov firmly linked his work to that of the Society. 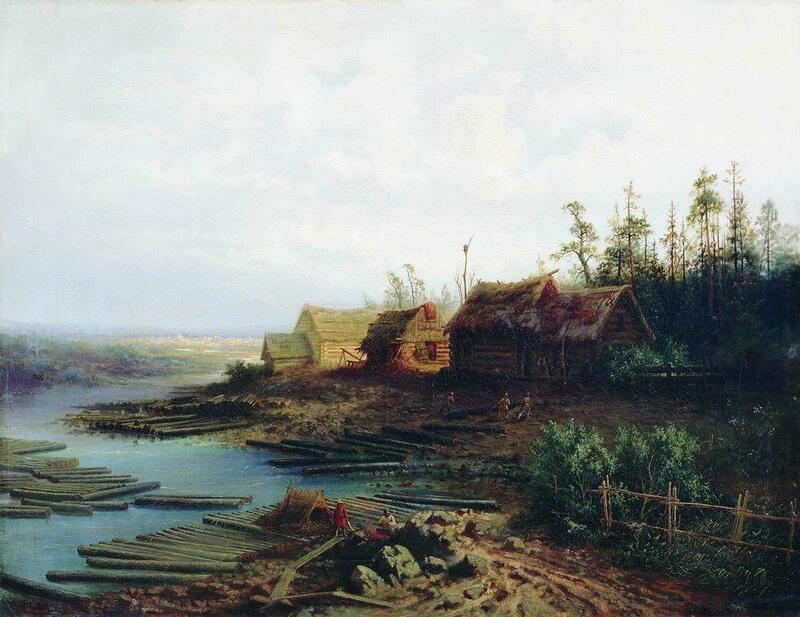 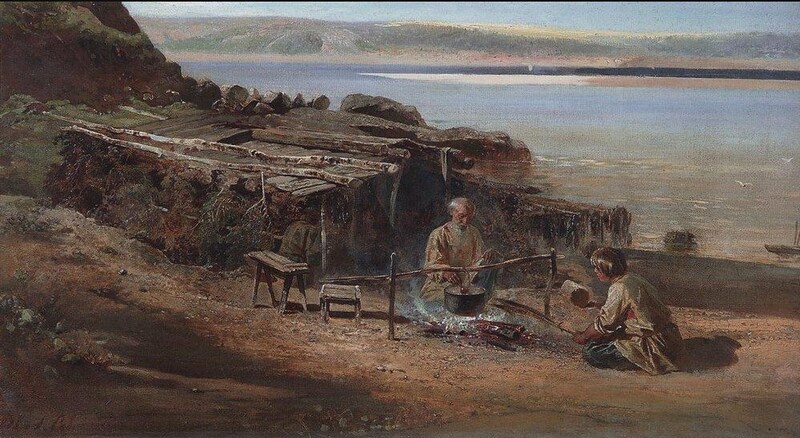 Many of the artist’s works were painted in the Volga area. 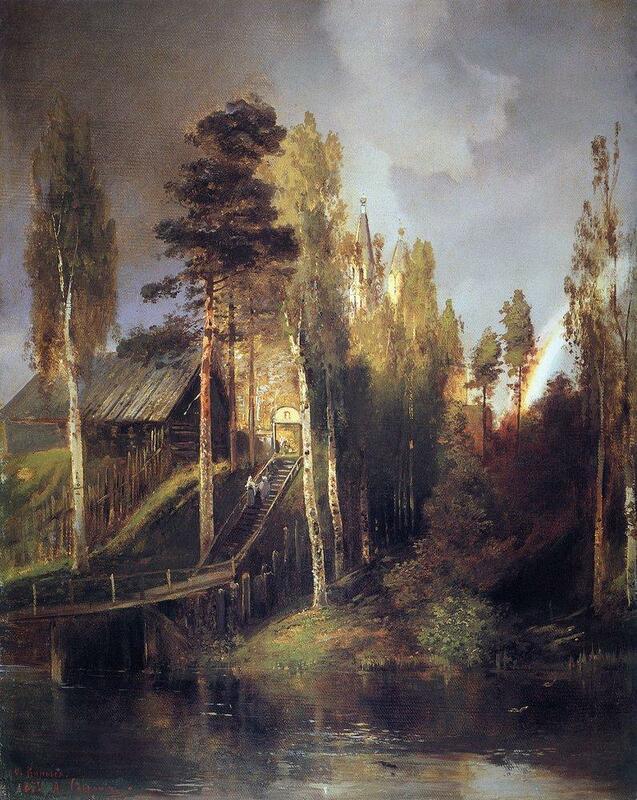 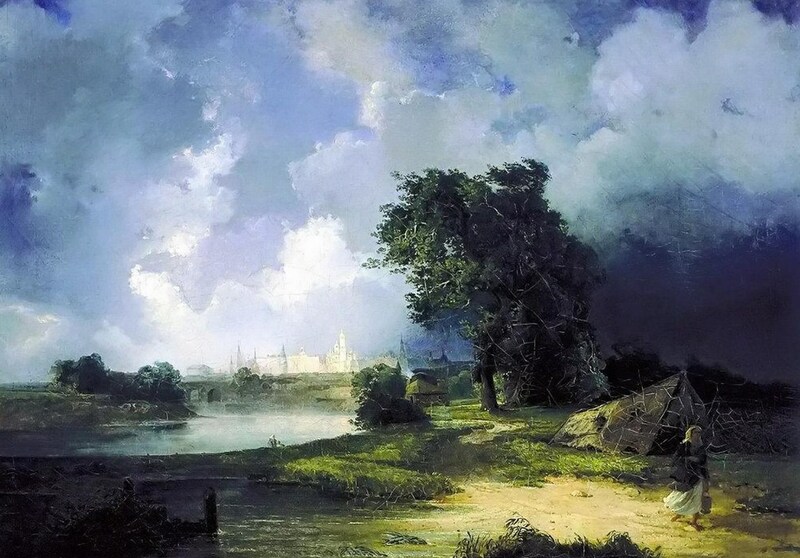 Savrasov worked near Nizhny Novgorod and near Kazan, but his favourite spots were between Yaroslavl and Kostroma. 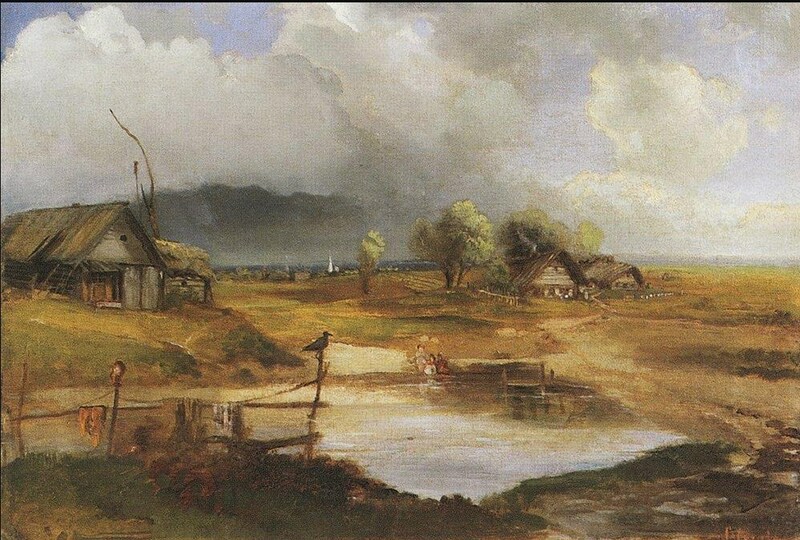 His pictures are varied both in terms of the states of nature conveyed and in terms of the spectrum of emotions evoked. 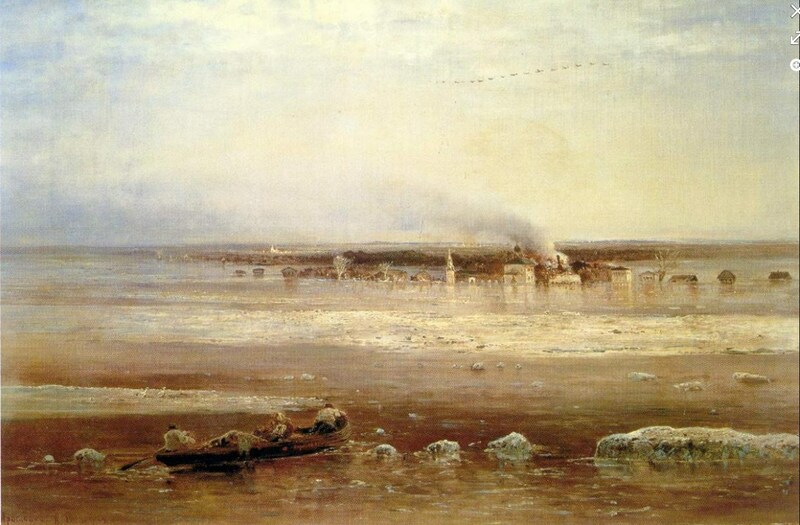 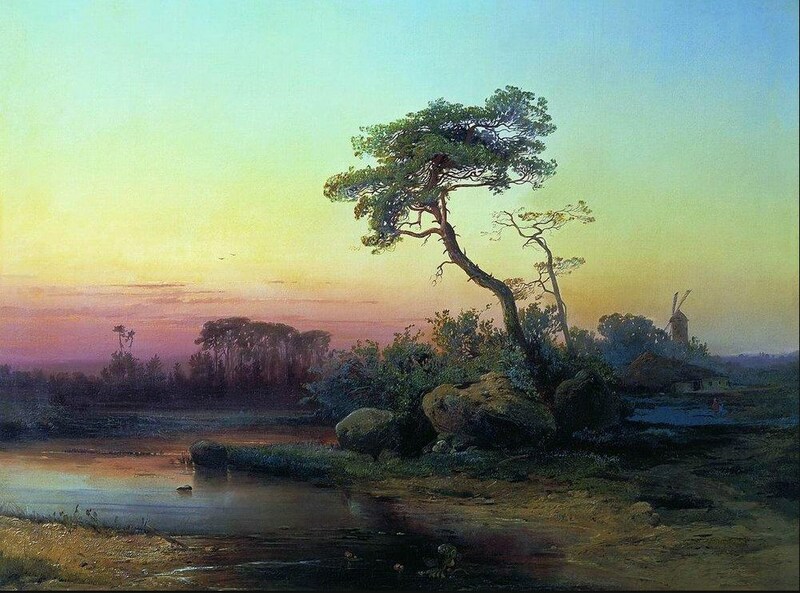 The landscape The Volga in Spate by Yaroslavl (1871, RUSSIAN MUSEUM, SAINT PETERSBURG) expresses the tranquil might of Russian nature, in which ‘rivers flood and turn into seas’. 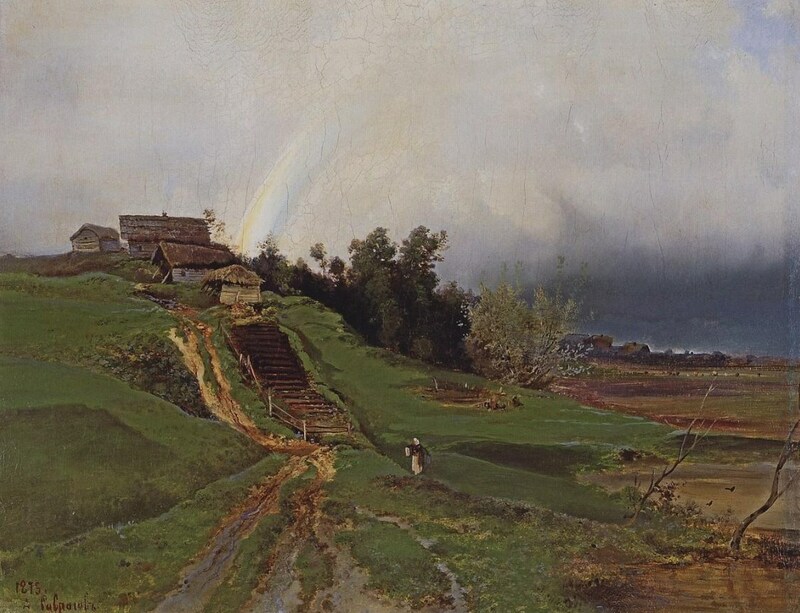 In some works nature appears renewed and rejoicing—Country Road (1873, TRETYAKOV GALLERY, MOSCOW), Rainbow (1875, RUSSIAN MUSEUM, SAINT PETERSBURG)—while in others it is agitated and poetically elevated—Evening; Migration of Birds (1874, Odessa Picture Gallery). 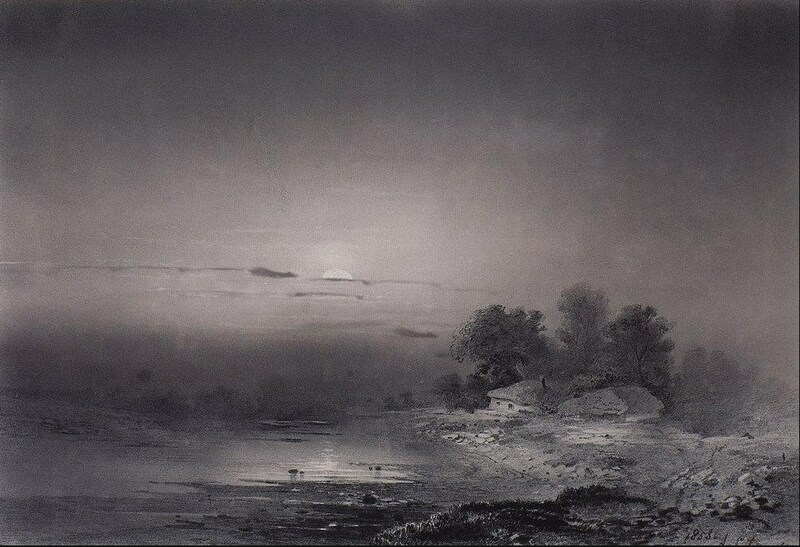 In the seventies Savrasov’s works began to express more sadness, anxiety, or even acute grief—A Moonlit Night. 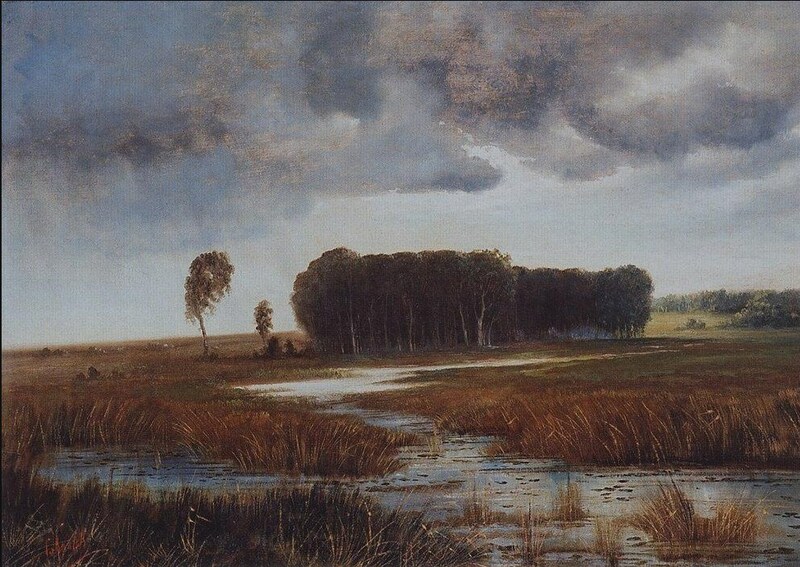 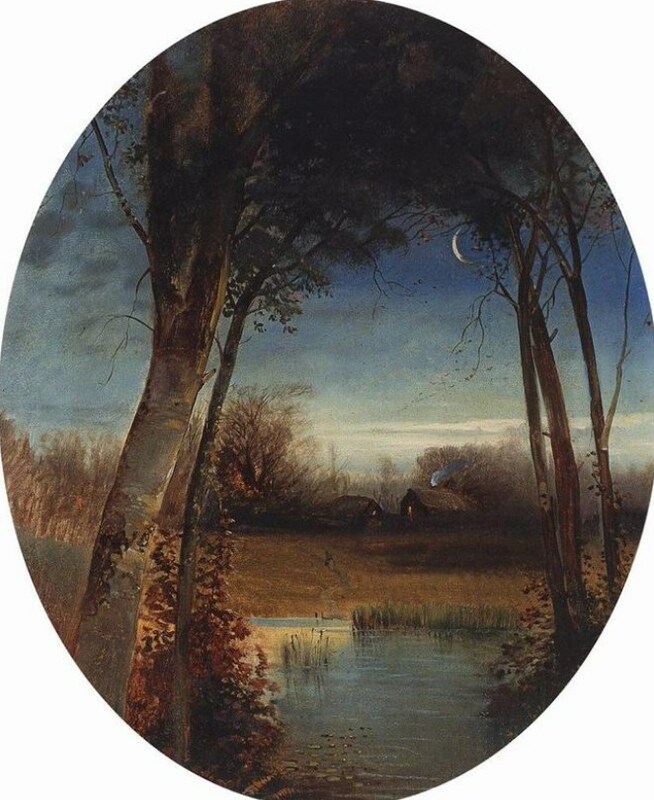 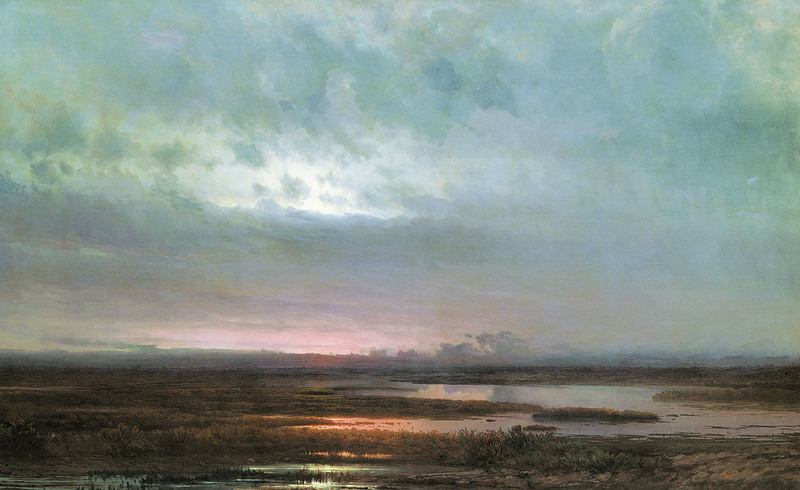 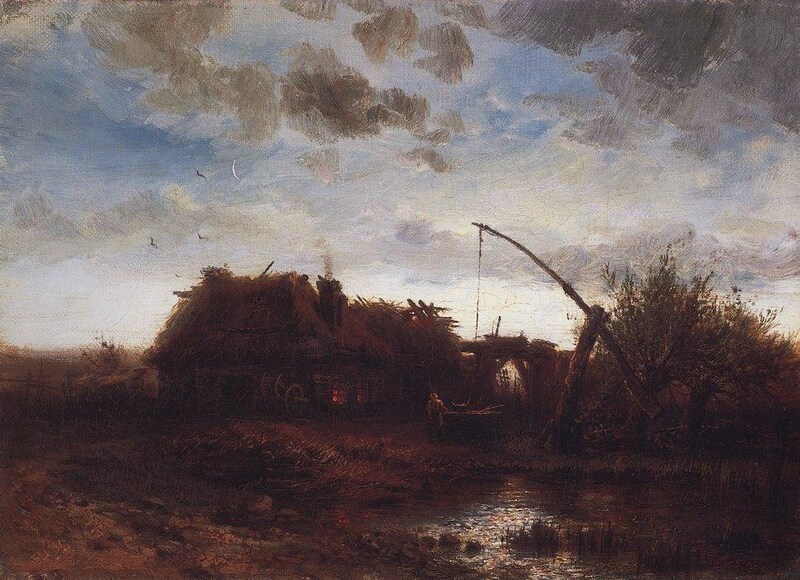 A Marsh (1870, TRETYAKOV GALLERY, MOSCOW), Sunset Over the Marsh (1871, RUSSIAN MUSEUM, SAINT PETERSBURG). 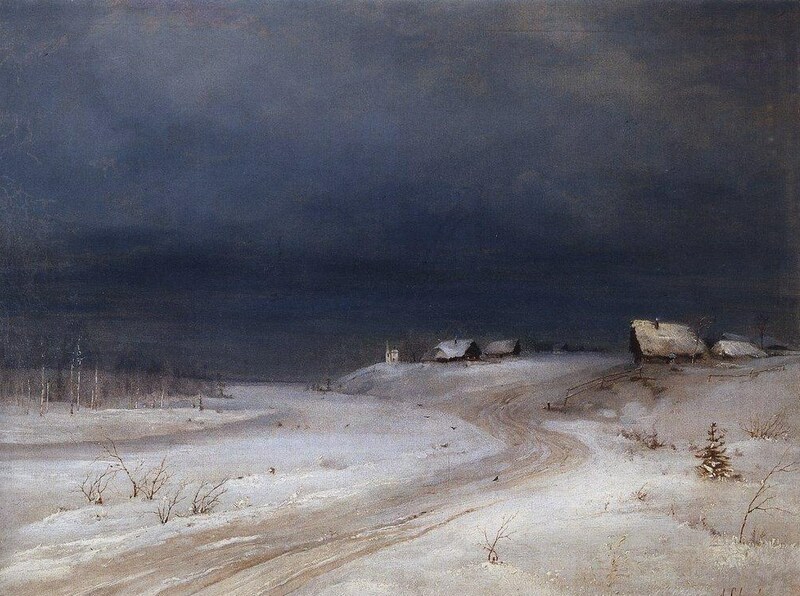 Under the impression of a personal tragedy, the death of his daughter in 1871, Savrasov created one of his most dramatic works— Graves Above the Volga (1874, private collec­tion). 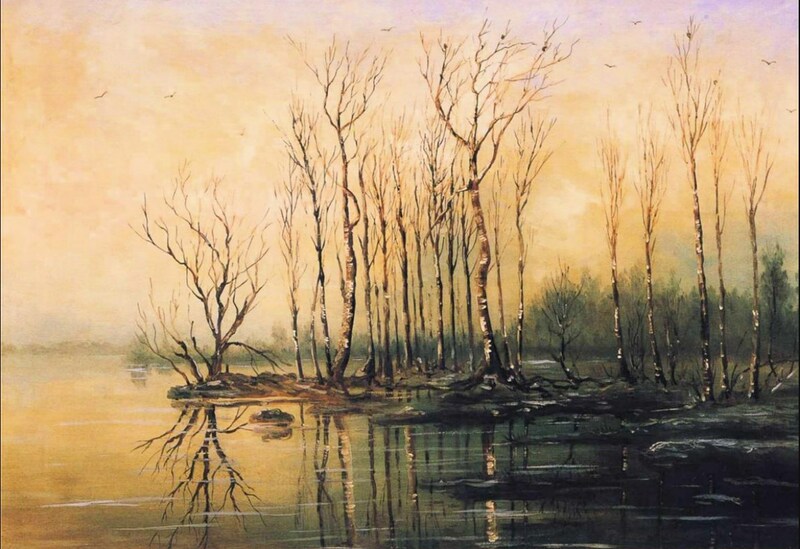 At the end of the seventies the artist fell se­riously ill, and his work showed signs of decline. 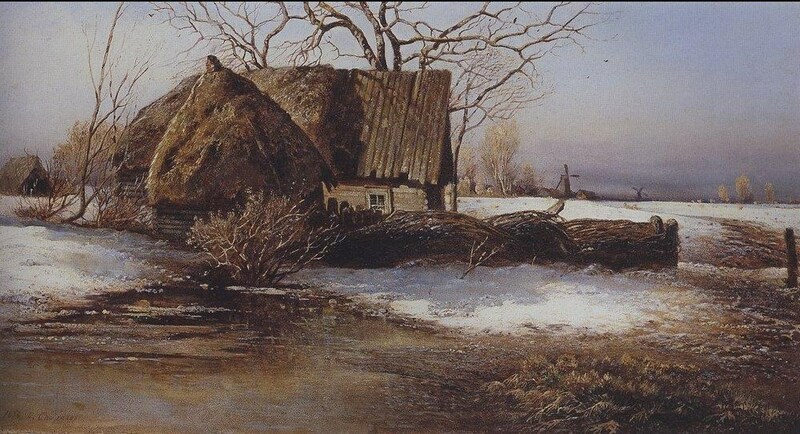 But even in his late period he produced some genuinely poetic works, including Rye (1881, TRETYAKOV GALLERY, MOSCOW), Winter Landscape (private collection), A Northern Village and Spring. 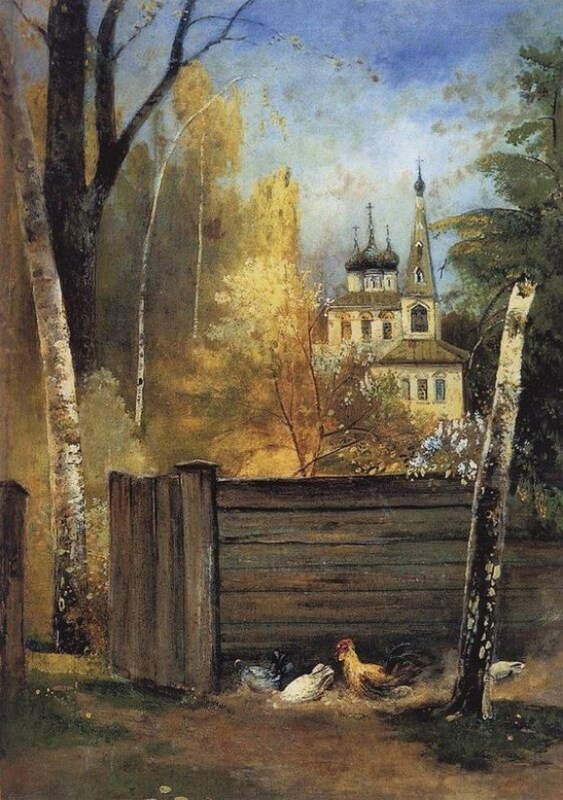 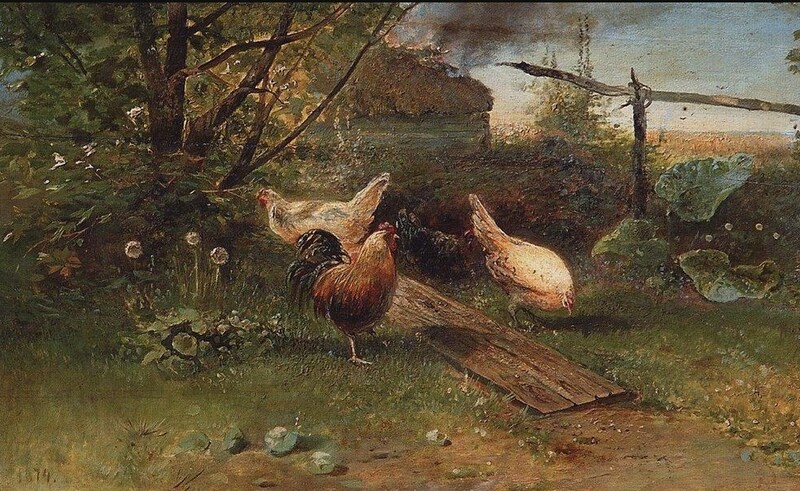 Kitchen-Gardens (1883, PermStateArtGallery). 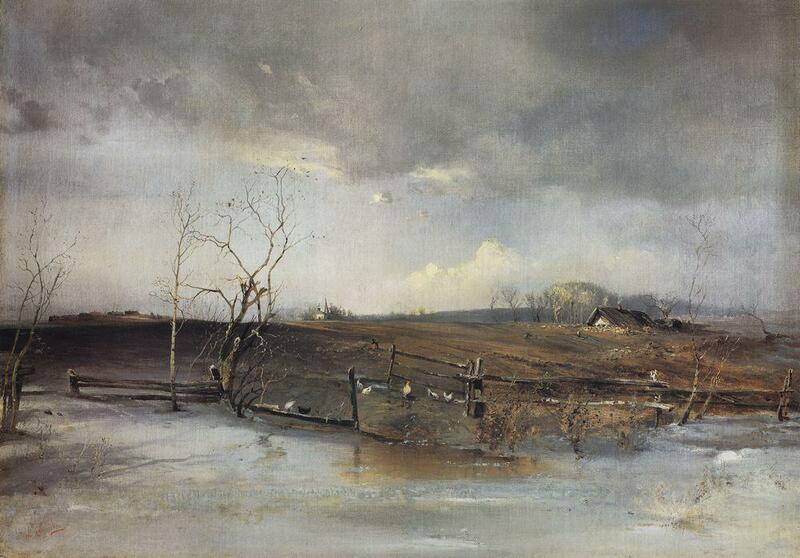 The last decades were not easy ones for the artist. 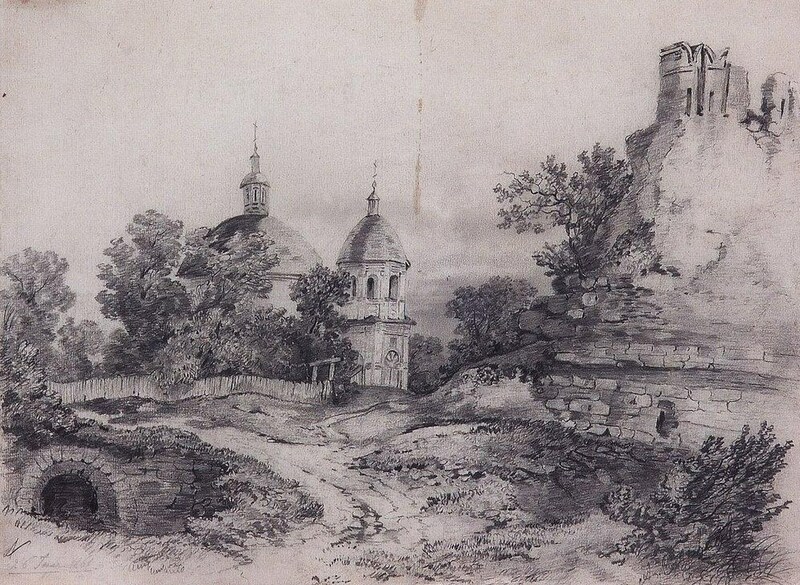 It is known that Savrasov asked for loans of money and for a flat from the state. 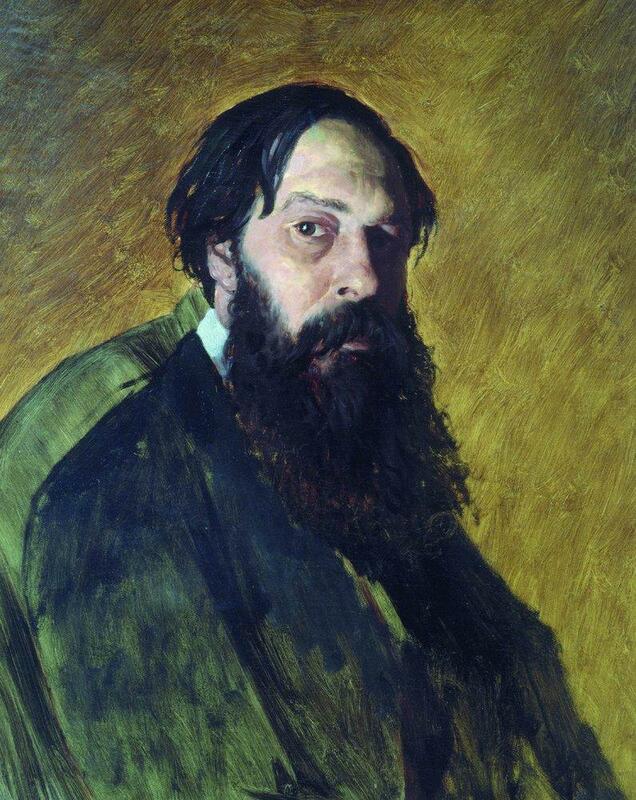 He spent his last years in destitution and died on 26 Sep­tember 1897 in Moscow.